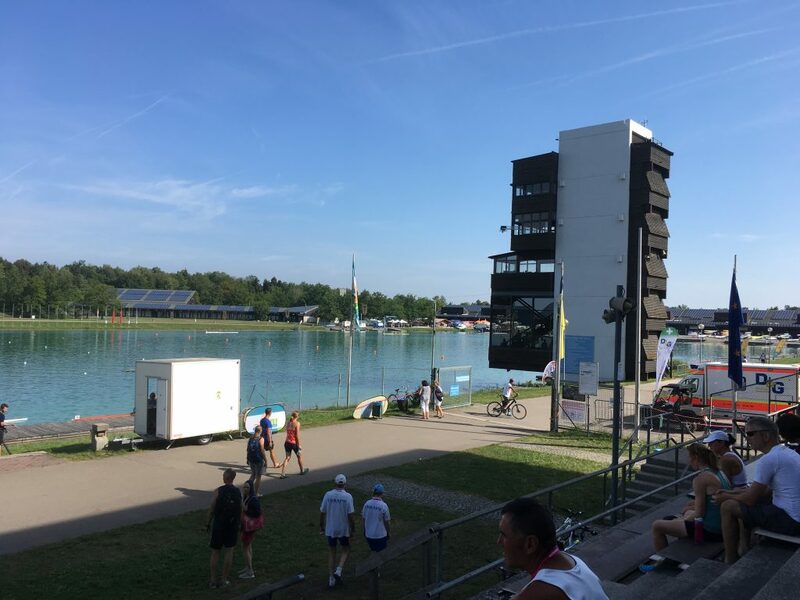 Thursday, July 26th, the first day of the Euromasters Regatta 2018 at the 1972 Olympic rowing course in Munich. We’re here. This is it. The end of a long season of training and racing. The final regatta before the vacation break. I had to be realistic. A busy (and deciding) year at work and time invested in the rowsandall.com site has cost me quite some training hours. Stravistix tells me I am 25% behind in training hours since January 1, compared to 2016 and 2017. The regatta itself seemed 25% bigger than the previous edition. More boats. More people. More food stalls. More merchandise. An extra race day. Higher temperatures (highs well above 30C, not a lot of cooling off in the night). At 14:21 in the afternoon, Kazi and I lined up in lane 1. I was nervous. If there was a race with the biggest chance of finishing first or second, this was it. It was a strong field, but Kazi and I row a nice double, and Kazi’s season is strong. 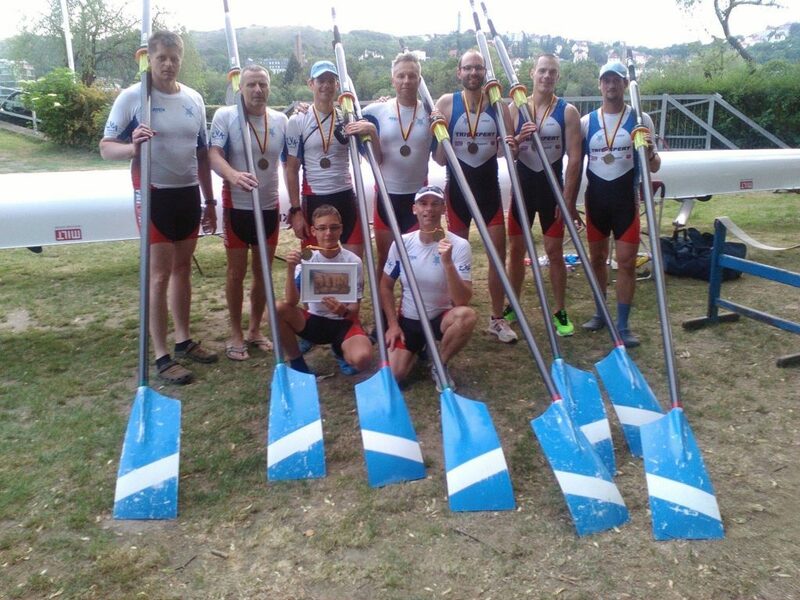 We were lined up against Exeter on lane 2 (this year’s Henley Masters winners in the C category, as I was told on Twitter), our friends from Bohemians Praha, Germany, Austria and Spain. Out of the start we were slow, but we quickly recovered and after 250m we were in second position, half a length behind Exeter. At the 500m mark the field broke apart in two halfs, with Exeter and us in front, then water, and then the rest. This happened just after I started our attack on Exeter with about 600m to go. The attack brought us almost level, but we went past them only after the 500m. They tried to come back but must have been slowing down more than we did. We defended our position. Their attack lasted for about ten strokes, and we could row the final 150m being certain of our win. 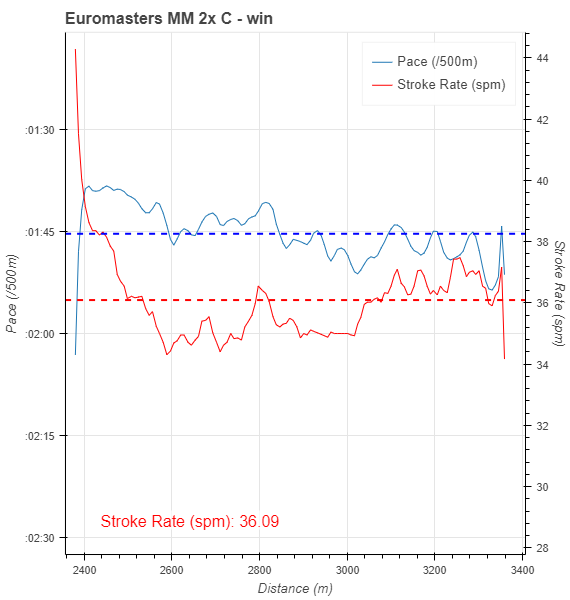 True, Exeter was just half a length behind us but we had some reserves still, as the stroke rate chart confirms. Yes, I had to rate up to hold our position, but with Kazi behind me I could have gone up to 40 spm without the boat falling apart. So the first race was a win! 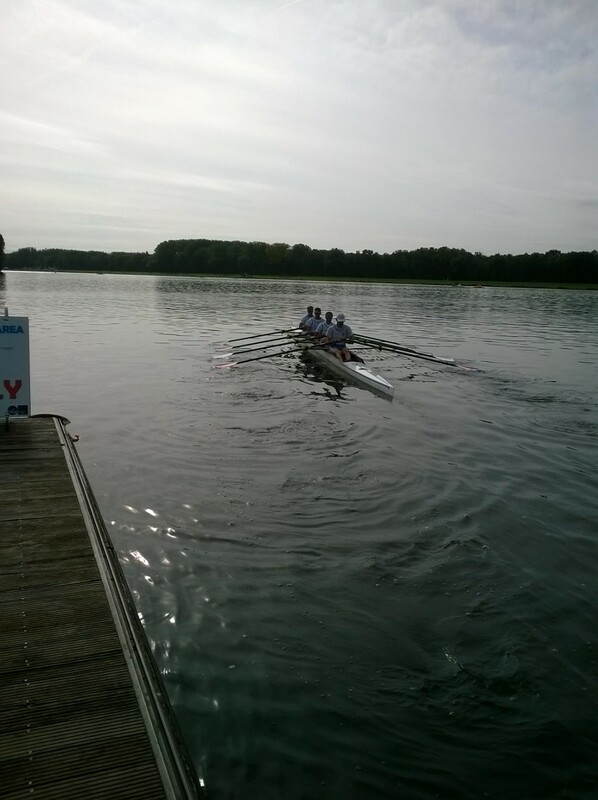 The time was not great, but we were rowing into a headwind, and times in Munich are in general not very fast. It’s a slow course. Here’s the video of our row (forward to 1:28:00 where our race starts). On Thursday evening, Romana and I did a quick 4km row to reset ourselves after the choppy adventure of Monday. The draw had been pretty strange for all races. 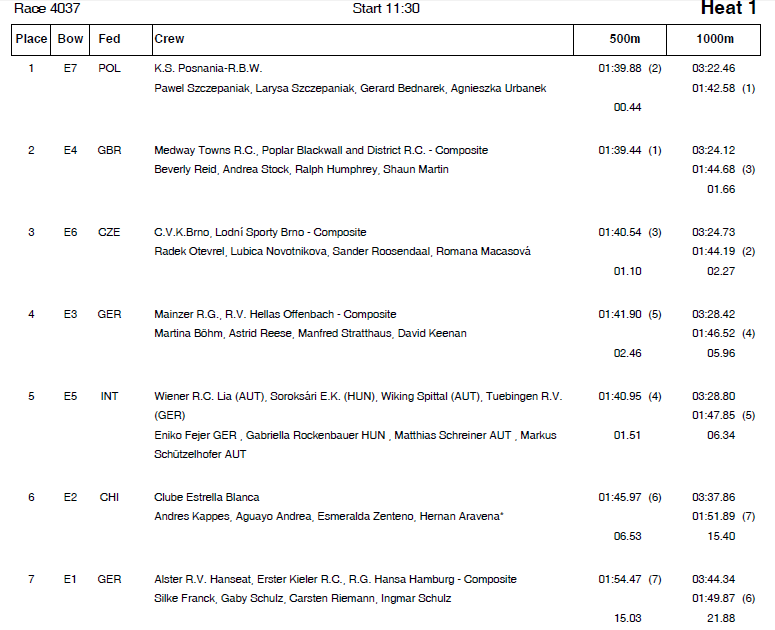 On Thursday’s M 2x C race, we were up against Bohemians Prague, a double that I have raced already twice this year. 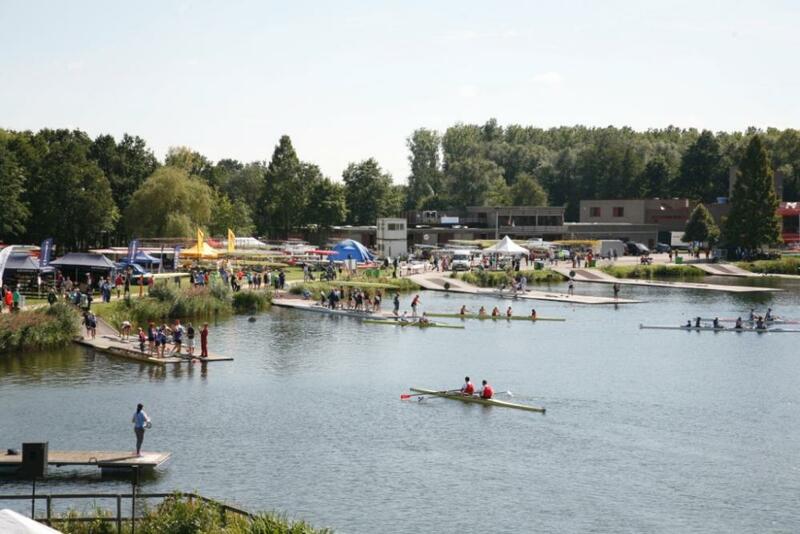 On Friday’s M 1x C races, it was even worse. In one final, the two Bohemians guys were racing each other, and in the other final Kazi and I were. Our fan clubs had given us orders to occupy the first and second position. Kazi had beaten me in Trebon at the Czech Masters. I knew he was a hard nut to crack, and I was sure there were some other fast scullers in the race. There was only one option, perhaps. And that was to go out fast and be ahead of Kazi after 500m. He has given up in such positions in the past. There we were, lining up at the stake boats, Kazi in lane 2 and I was next to him in lane 3. Attention – Go! 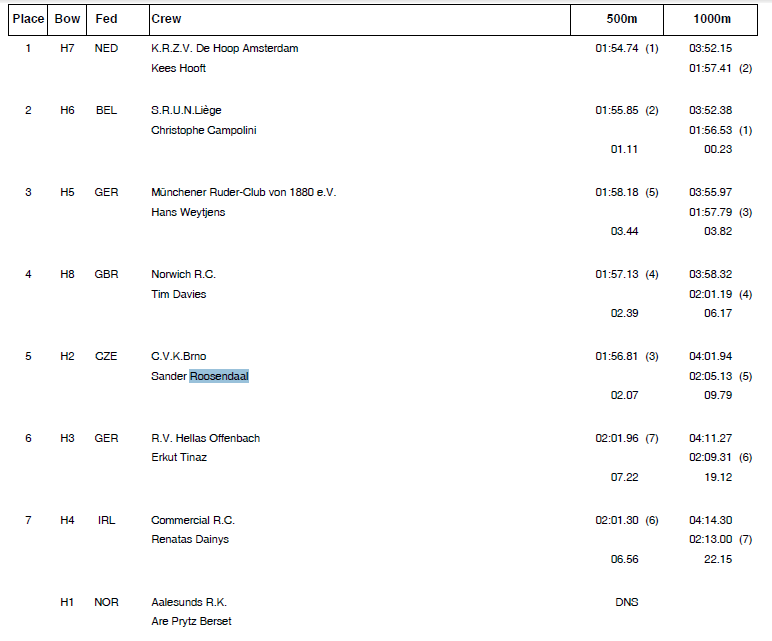 We were both very well out of the start and after 200m, it was Kazi slightly in front and me rowing in second position. I tried very hard to stay close to him, but unfortunately he had a really strong day and just steamed away, creating a boat length of light between us with 500m to go. I was also busy defending my second position against a Sankt Petersburg from Russia. My third 250m was really bad. I saw power values going to 280-290W and I just didn’t find a way out of that. Some steering issues as well. The Russian guy passed me. With 250m to go I refound myself and I passed the Russian again. Romana told me later that Kazi in front was now really struggling with the consequences of going out fast as well. Apparently, we were catching up fast. A great race, except for a badly executed third 250m. Perhaps the penalty for going out too fast? The times were slow because of head wind. The charts are quite clear. 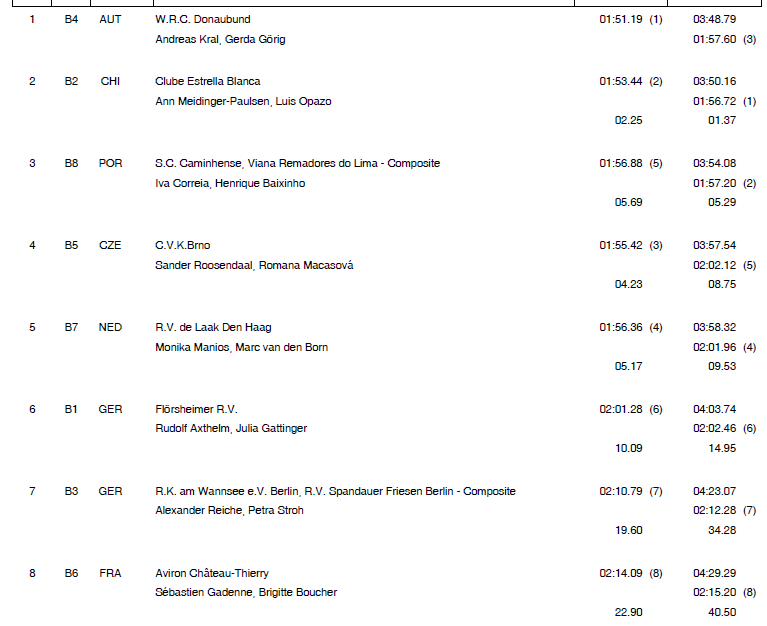 The girls were second after a strong Austrian crew. 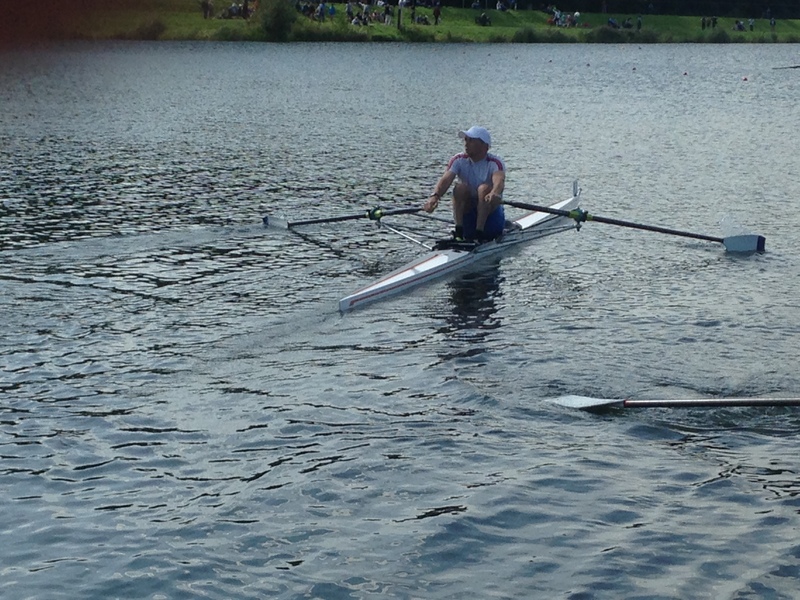 At 8:12, Romana and Veronika rowed a great race in the double. They were third, but against some really strong crews, and their technique and race strategy were exemplary. On Friday evening, Kazi had been teasing me with his medal from the single. Well, on Saturday I had another chance to row the single. 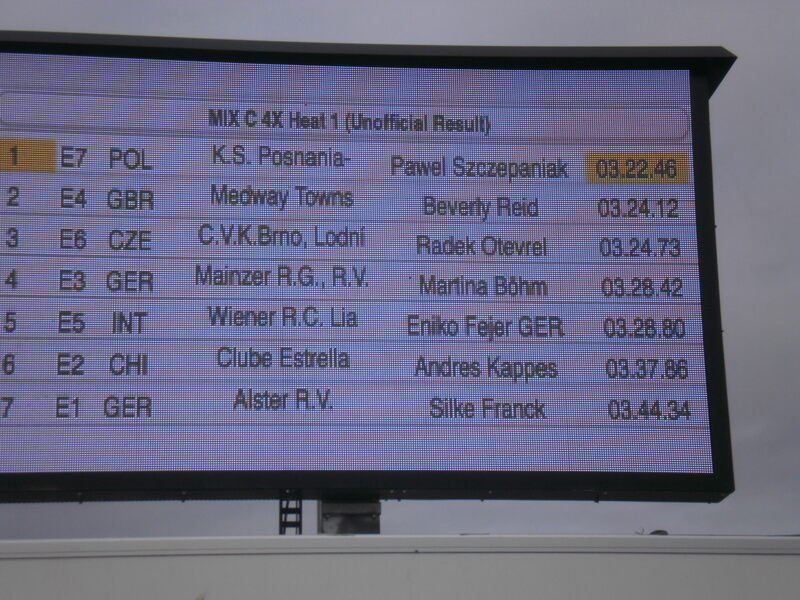 This time I was up against people I didn’t know, although I had heard that Carsten Brzeski from Wiking Berlin was pretty good (had won the C 1x a day before, one heat before us). 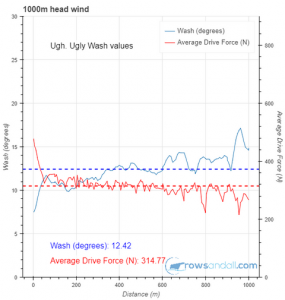 Average power was still only 300W. I had hoped it to be 20 Watt higher. Need to train more consistently. This 1x race was also the one with the funniest comment shouted at me from the shore. Radek, one of my 4x crew cycled alongside me, together with Romana. With me rowing in third position and the winner far in front, he shouted: “Save some energy!” right at the moment when I rated up to 36spm. Romana commented that I apparently didn’t listen to Radek. That 4x- race was almost immediately after the single. The start times were just 65 minutes apart. I quickly changed dress to Hodonin colors (this regatta requires uniform dressing), drank some water and had some sugar. 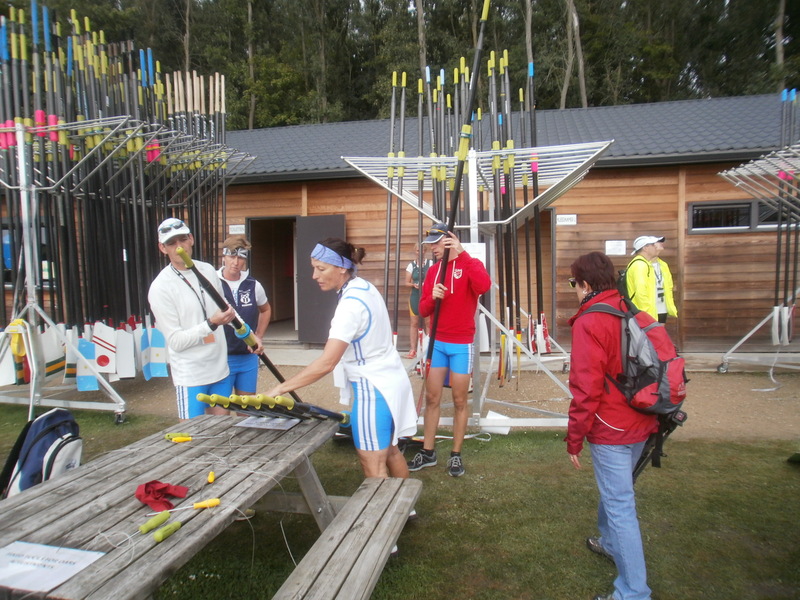 In the quad, I rowed on bow seat, replacing one of the Hodonin crew that had come third (after us) at the Czech Masters. I really enjoyed this race. We were in front at the start and then rowed away from the Germans. 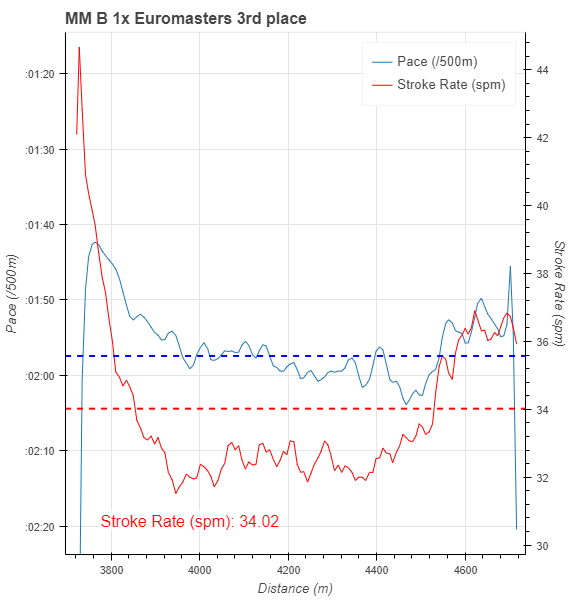 The Italians were a bit too far in front for us to catch, especially as Radek is a less experienced rower, so we couldn’t go all crazy with stroke rate in the final stages of this race. Second place at this regatta is not bad for this crew. As we were scheduled to race at 15:46, we had a long day of waiting in the heat. We spent the time watching other races from the grand stand. 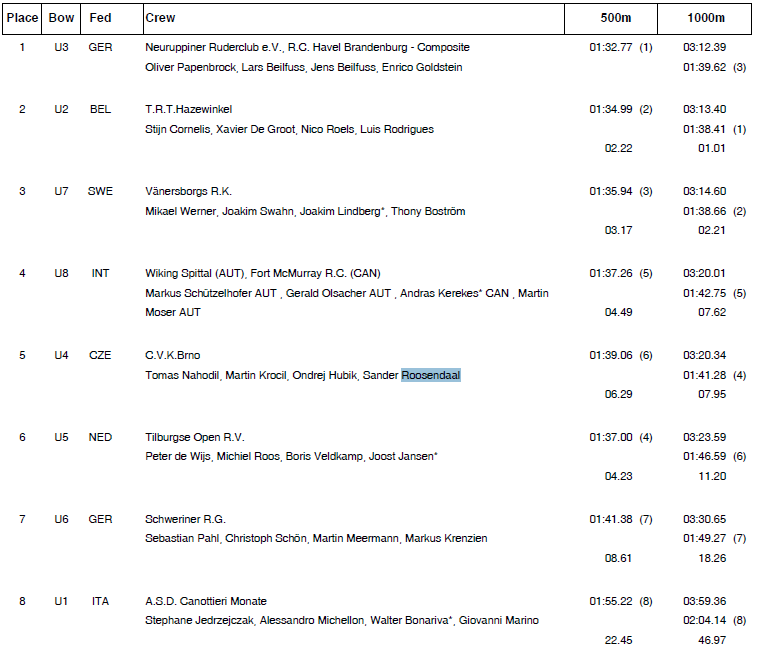 Fabrizio Tucci, one of the winning crew of our quad race, was lined up against Romana and me in the C category Mix 2x. They really looked confident at the start, and so did the Leicester/Nautilus Anglo-Dutch combination. Our start sequence wasn’t executed perfectly but we were still the first boat after 10 strokes, so I kept the stroke rate high for another ten, which gave us a lead of one length. In the next 250m, we built out the lead by another length. Our rowing was not the best. Romana was catching slightly early, which I tried to anticipate, but that resulted in us going in a pretty high stroke rate. I shouted “Calm down” but Romana understood “Go!”. So she started to push even more. We were leading by two lengths and, this being the fourth day of racing, I was really getting tired. We got awfully close to the lane buoys but we managed to steer back again. You can see all that on the video (fast forward to 2:39:00 for our race). Still we won by a large margin and were really happy. 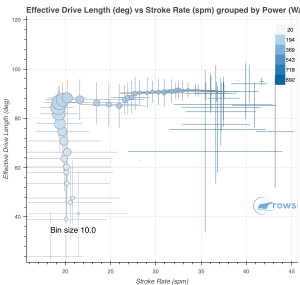 The stroke rate chart tells the story. No power tens. No sprinting. Just keep going at 35/36 spm. After loading the double on the trailer, we went for a swim, and by 5pm we were on the road driving back to Brno, where we arrived at 11pm. And that, dear readers, is the end of the sprint season. Time for vacation. I am looking forward to taking a two to three week break from rowing and structured training plans. The plan called for a 1k full out as race preparation, but I decided that I better spend more time at work to finish some things, and I also think that taking some rest in the taper week is not a bad thing. I adapted my plan for Tuesday to compensate for that. Short training. I arrived at the lake after work and it was very choppy. A few white caps here and there. The plan was a 750m at race pace and then two 250m full out sprints. That’s all. I managed to fit that into 6km including warming up and cooling down. It’s taper week. 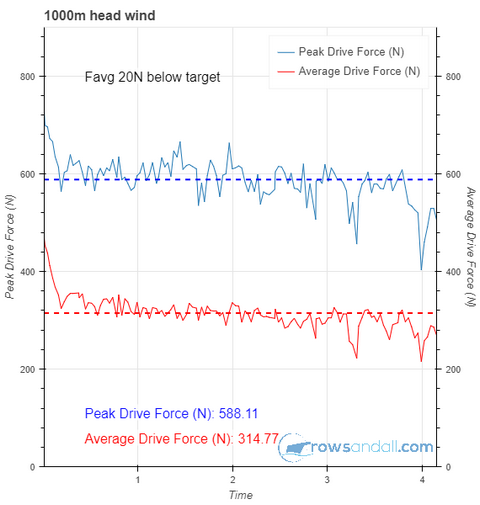 I rowed the 750m in cross/tailwind with white caps. 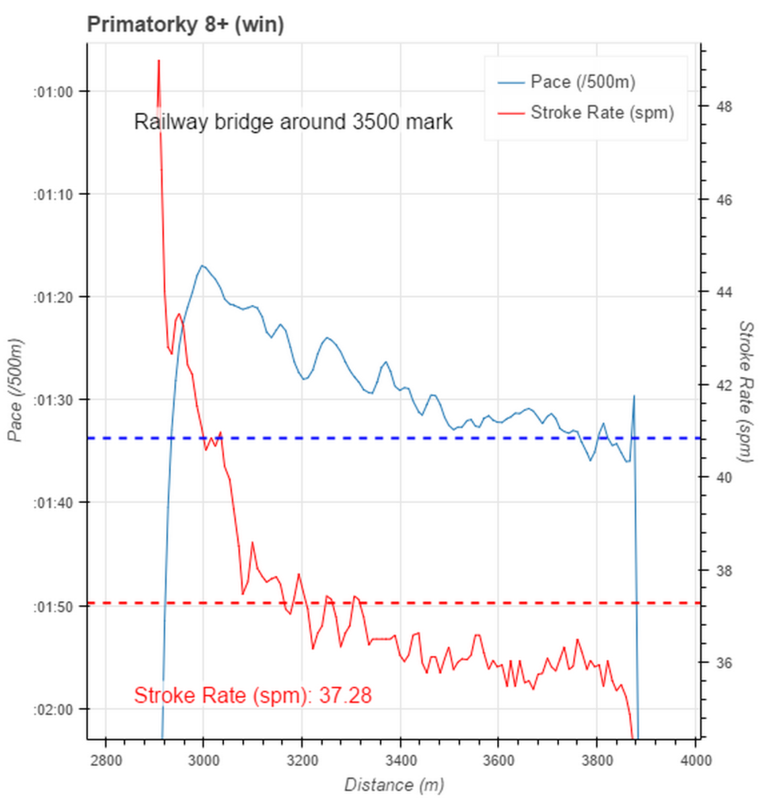 That caused the stroke rate to drop a bit below the envisioned 34spm. I also had to make sure I crossed in front of a big tourist boat, so that required some head turning, and I rowed through the wake of two sailboats who were enjoying the windy weather. It was fun but it felt awful. 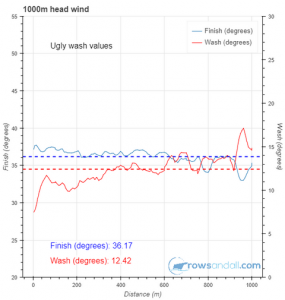 I am surprised that the summary gives such a low power average for the final 250m, because despite the chop I thought I was able to bring up the power again. 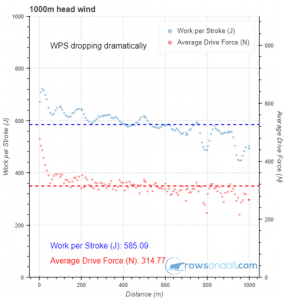 Probably, because I check the SpeedCoach only now and then during the row, some of the strokes in the chop were a lot below 300W. It happens. When it happens in a race, all have the same conditions and the one who deals with them best, wins. 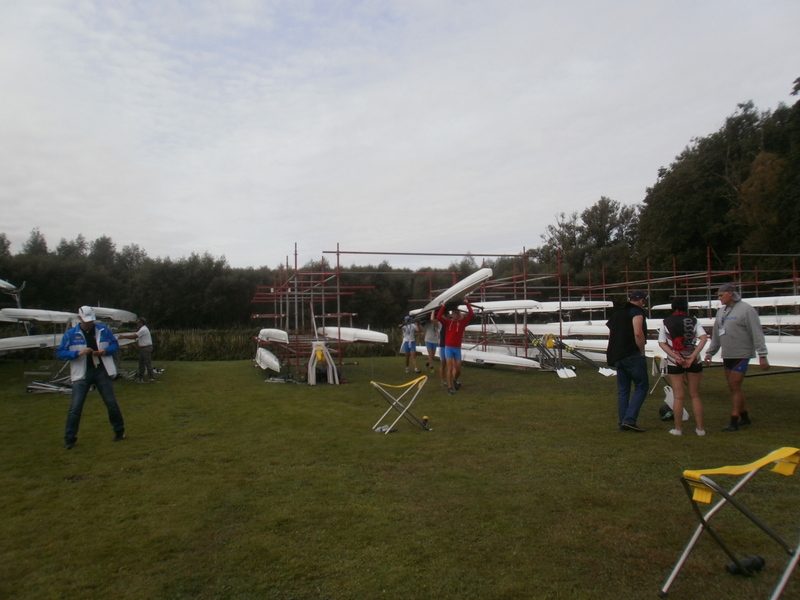 I paddled for ten minutes and got ready for the first 250m. I guess that the SpeedCoach started a few seconds too early, due to the chop, causing the strange value for the first few strokes. That was even more fun, battling against the wind. Total length. 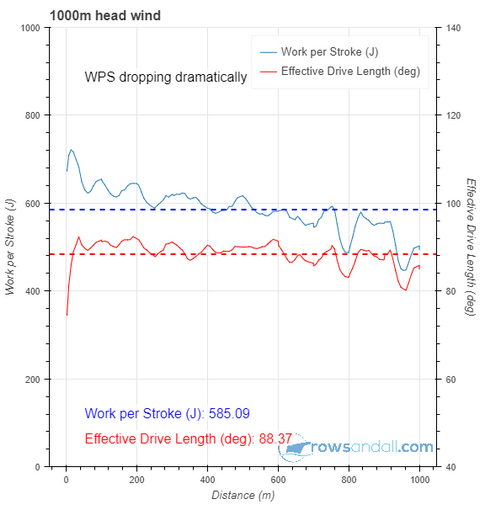 I seem to be shortening up at higher stroke rates, but effective length stays constant, so I shouldn’t worry about it too much, right? Effective length. 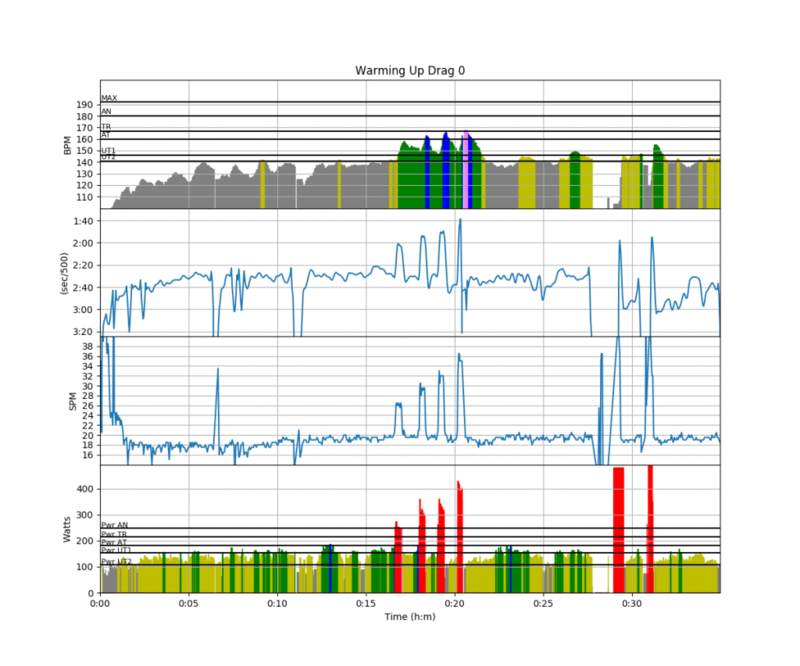 Wondering what is causing the dip around 25spm. 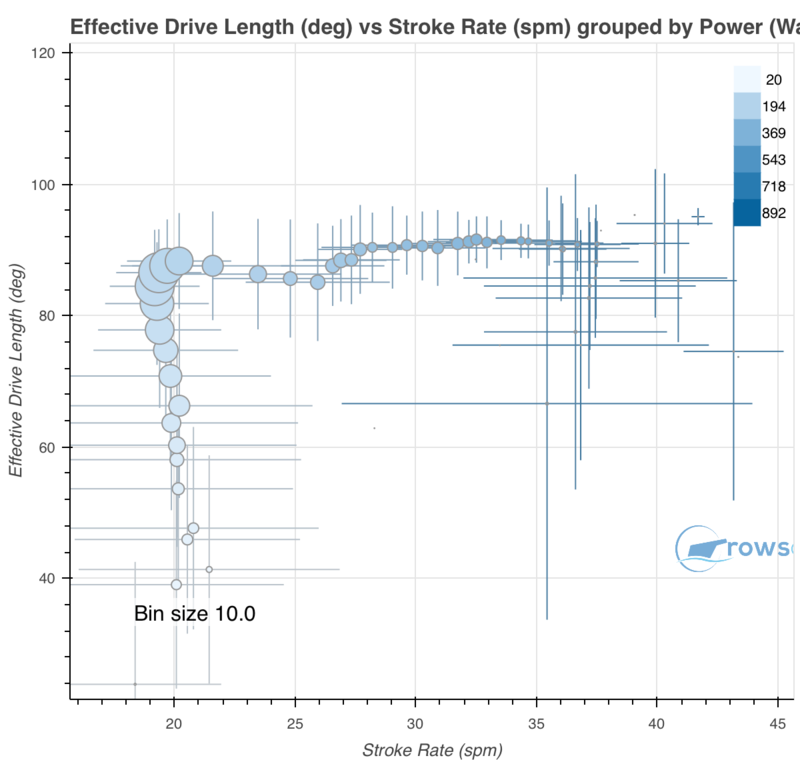 Otherwise effective length is pretty constant over the whole range. It’s a busy week. Lots of things going on at work, including customers visiting and a business dinner on Tuesday evening. On top of that, temperatures are reaching > 30 degrees, already for more than a week, and on Tuesday it was 35 degrees with extreme humidity. At home, the thermostat in the living shows 28 degrees, and in the bedrooms it is warmer. This severely impacts my sleep quality. On Wednesday morning, I rode to work. It was a dusty, high ozone affair, but I was glad I did it, knowing that the repair of my single hadn’t started, there was strong wind predicted due to cooler air nearing our region, and the fact that I still hadn’t found time to prepare my quarterly Town Hall meeting. The mailman delivered “How bad do you want it? Mastering the psychology of mind over muscle”. I read just the foreword, because I had a presentation to prepare. With the Masters Nationals in two weeks, I wanted to know where I stand. I got up early to get the workout in before work, and the plan was to do a trial 1k. I had originally planned to do this one on Friday, but it seemed smart to do it today. When I arrived at the lake, I was greeted by very choppy water. While the coolness has still not arrived (it was 21C at 5am), this is already the second day with strong wind. I decided to row to the castle and row the 1k on the “straight kilometer”. The wind isn’t weaker on this stretch, but because the river is a lot narrower than the lake, the chop is reduced. Usually I try to row these trials in calm weather, but this time I thought it doesn’t matter. 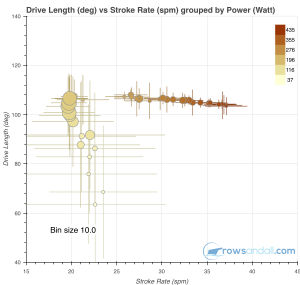 I have a power meter, right? I am just measuring my max power over a certain duration. 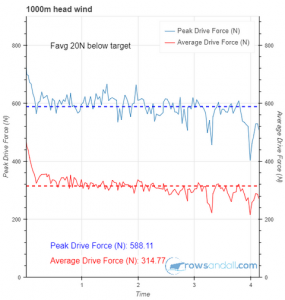 So, I thought, I might as well row the 1k in the headwind. Who knows when I will have to row a race in headwind, so I might just as well try to find out how hard I can pull over, what, 4 minutes and a bit? Just 1k. How hard can it be? For a competitive person, there is a problem with this chart: It looks like a challenge. 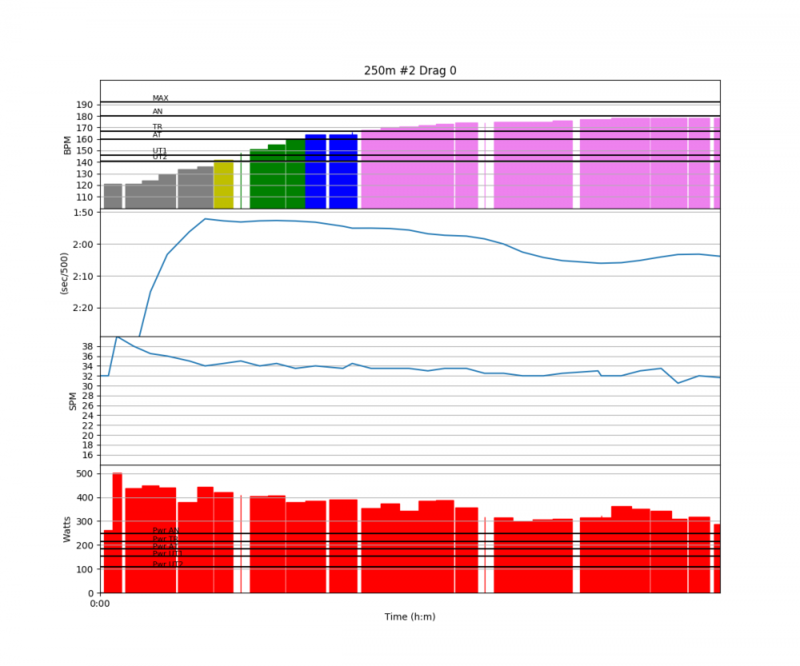 I want to move the data points to the right, or up. And as a bonus, if you set up notifications on rowsandall.com, you get a congratulatory email for every time you break through the red line. For a four minute effort, the green line is at 305W, while the red line is at 326W. 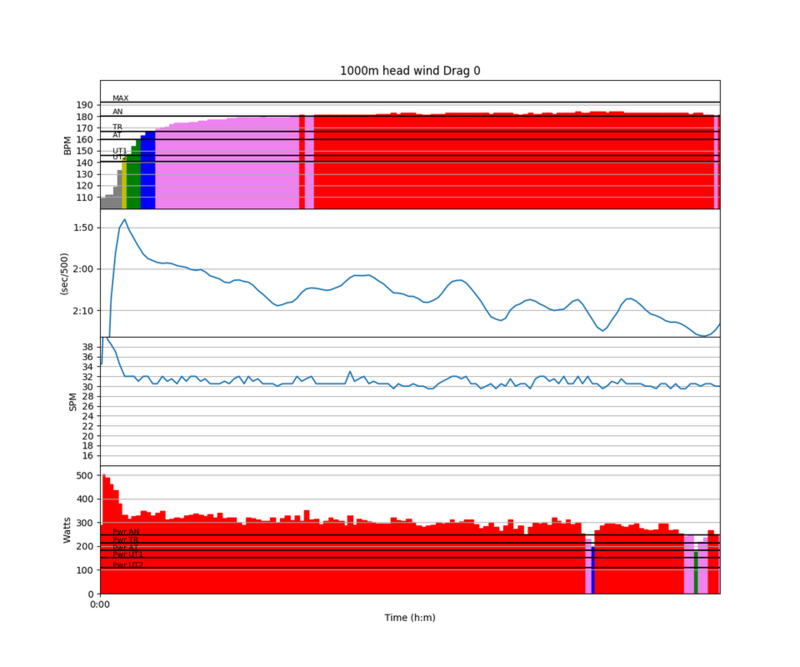 So, the plan was to do a start, then drop back to 320W, then try to increase in the final 250m, all the while monitoring technique. 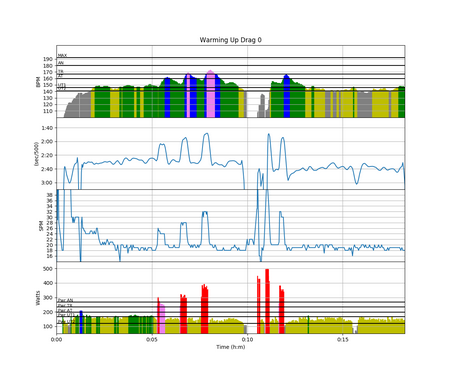 I was already composing the blog post with a before and after CP chart. I was also looking forward to rowing this 1000m “smart”, and not fly and die. The reality was different. I had forgotten how hard 1k rows are, especially in the morning, alone, in non-ideal conditions. I crossed the lake in heavy chop, then into the gorge. I did a few 10 stroke bursts on the straight kilometer, and a few practice starts after I turned around at the castle. I had the impression that the wind was getting stronger. I lined up for the start, dialed up a 1k, took a deep breath, and got started. The plan fell apart after 200m. I didn’t know it immediately, though. 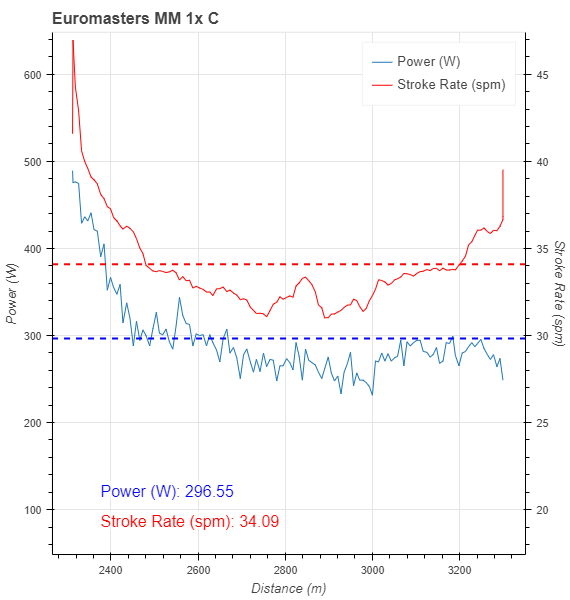 I came out of the start strokes with 400W, and then I lowered the power by lowering the stroke rate, which probably was a mistake. 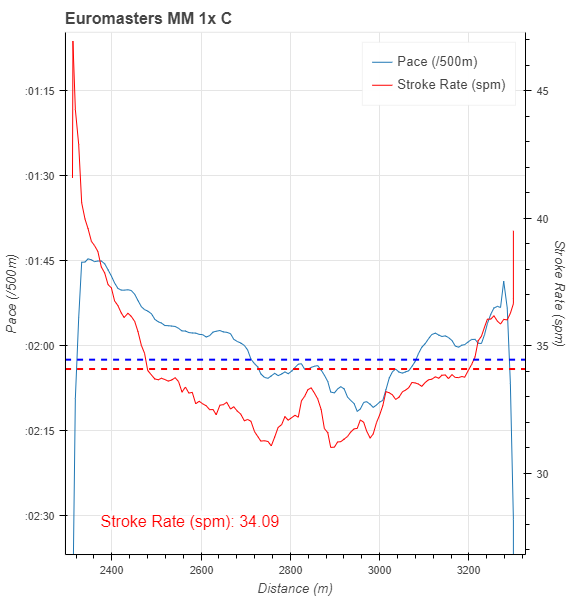 I should have lightened up the stroke but not allow the stroke rate to drop below 32spm. 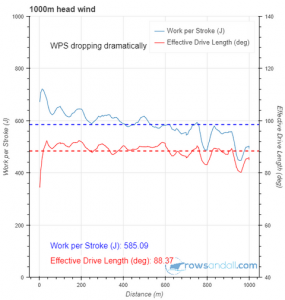 It is very hard to recover from a low stroke rate. At that moment, I wasn’t aware of these risks. I just saw that there were strokes where the power was getting close to 300W. I tried to get the power back to decent values but it was very hard. Drifting a bit to port, I also had to turn slightly, which doesn’t help with the recorded power on the starboard oarlock. The gusty wind didn’t help either. Interesting enough, the average split was very close to what I had estimated before. I was expecting 2:05, based on the wind strength. So even though the power was lower than expected, the pace was in the ballpark. I had about 3km to cool down and think about my failure. In the headwind, and demotivated, I didn’t go very fast. The lake part, the final 2km, were virtually unrowable. 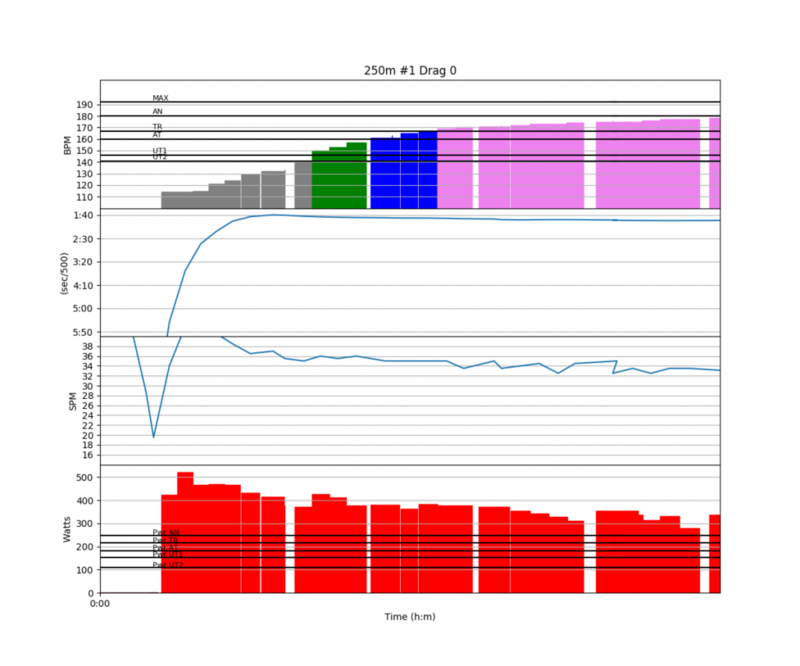 I saw plots around 3:30 per 500m. I eventually made it back to the club. Of course, I want to set a better record. I even contemplated doing this again tomorrow. I probably won’t do it, but going into the last two weeks before the Nationals, I will have to focus on 1k race preparation, and do at least two more trials. Anyway, today’s failure should lead to tomorrow’s success, and at least it will motivate me to read in the book about sport and psychology. 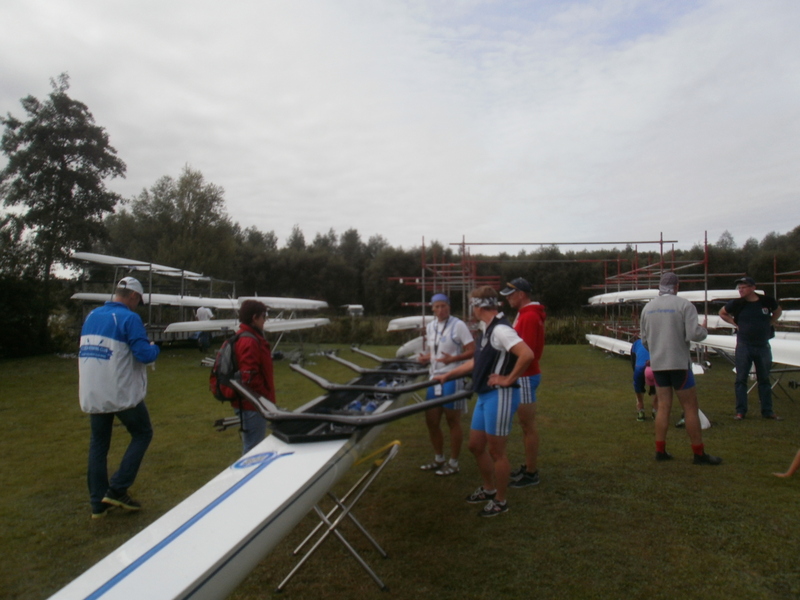 Four boats at the start of the first race of the Masters 8+ program of this most prestigious of Czech eights races. A jaký byl první den 104. Primátorek? Podívejte se na video ze včerejšího úvodního závodního dne, který byl ve znamení závodů handicapovaných veslařů, žákovských kategorií a Univerzitních osem. Program pokračuje dnes rozjížďkami a finálové klání vypukne už zítra, v neděli 4. června! Přijďte zafandit na náplavku Rašínova nábřeží, nebo sledujte ČT sport či si nalaďte Český rozhlas – Radiožurnál ! But first, let me go back a year. In this post, I describe how we missed the start call of the race because we couldn’t hear it through the loud engine noise of a big boat next to us, how we came in second place, immediately filed a protest and got a re-row, which we didn’t row in the end. This year, we would just enjoy the races. Romana and I left Brno at 12:30, arrived in Prague a bit over two hours later, and it was so hot that the smartest thing to do was get a big glass of lemonade and retire to the couch in the back of the CVK Praha club house. I also downloaded this race’s official App and filled out my race predictions. I liked that, a cool new innovation. You basically predict the winner of each and every race, and you get 4 points if “your” crew wins, and one point if they become second. I had no chance of winning of course, because I had missed predicting all of Friday’s racing and half of Saturday’s. But it is still fun, and the scores are updated live. Betting with virtual money. After that, I slept for an hour and a half, on that couch in the back of the CVK Praha club house. Then I got up, and we did the warming up with the rest of the crew. So, at 7pm, we lined up at the start. To the left of us, Blesk. To the right of us a Blesk/CVK Praha combination in lane 3 and Pardubice in lane 4. Blesk were looking very confident. Our start wasn’t as clean as some practice starts had been, and I think I was off a fraction of a second in the first three strokes, but then we caught on and got going. After the start, the plan was to do 15 strokes at high rate, after which we would lengthen and settle for race pace. I listened to the cox counting the fifteen strokes and I focused on the stroke’s blade and the back of the guy in front of me. After the fifteen strokes, I dared a quick look out of the boat, and I immediately saw all boats more than a length behind us. Wow! So now we all focused on lengthening and we succeeded to do so. In fact, we found a lovely rhythm and we kept rowing away from all the others. By the time we arrived at the railway bridge, we had a length of light between the boats. There were two instances where we raced through motorboat wakes but we managed to do that pretty well. Under the railway bridge, Ludek shouts: “One minute to go!”. He always shouts something there. Even in the very choppy water we kept our distance to the other crews. Blesk started a final sprint. I slammed my blade into a wave twice, but we managed to stay together. First. I think the carps were still sleeping. Waited for the others to cross the line. Shouted three cheers for our opponents. 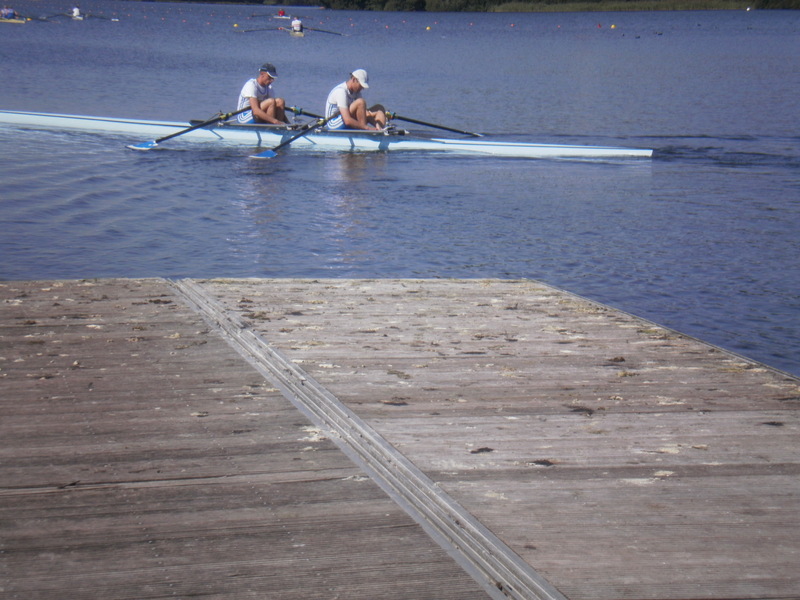 Rowed to the medals dock. Rowed back to the Rower’s Island. Two hour drive home. Which we filled talking about this 3 minute long race. 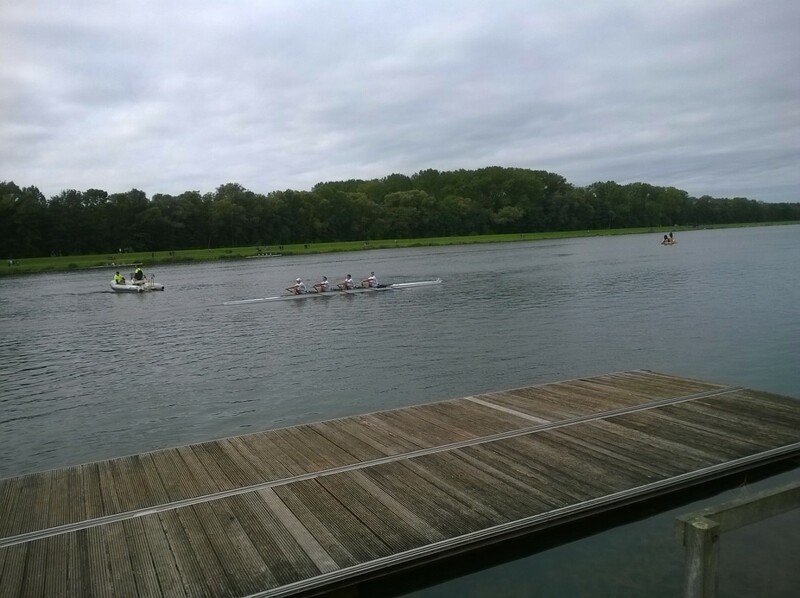 So we were by far the fastest crew of all Masters 8+, 14 boats if I also count the G and H race, who were of course a bit slower than the younger crews. All in all a very nice race! 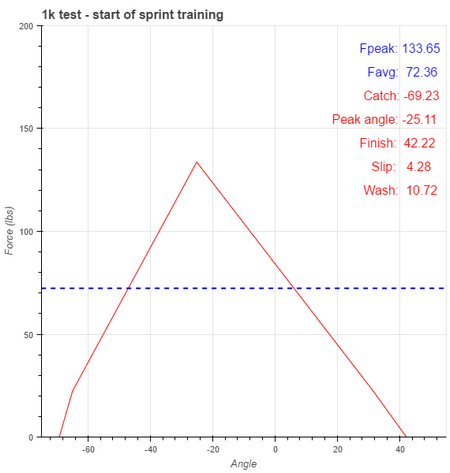 So according to Rowperfect, I am “on a mission to find the optimal pace when doing head races”. I liked that. I like being on a mission. I am already on the next mission. 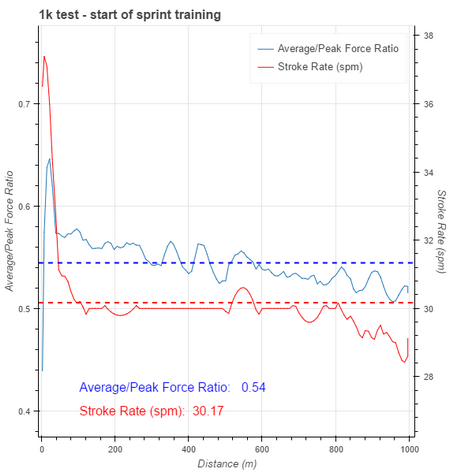 The 1k sprint season is starting. Since the head racing, I have lost some fitness, mainly due to me not putting in the required training volume. Work. Other stuff. So, I don’t know exactly where I am, fitness wise. A week and a half from now I will row my first Masters 1k race in the single. It would be good to have a few tries in before that. And now that I have a power meter, I can use it to help me pace the race. Start with the erg power value as a guideline. 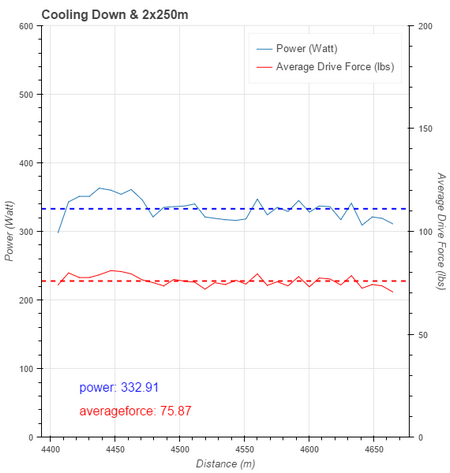 I estimate my current erg power for a 1000m (around 3:20 time) to be between 325W and 350W. On the water, everything is slower, so the race duration is longer, so I expect to end up a little lower. 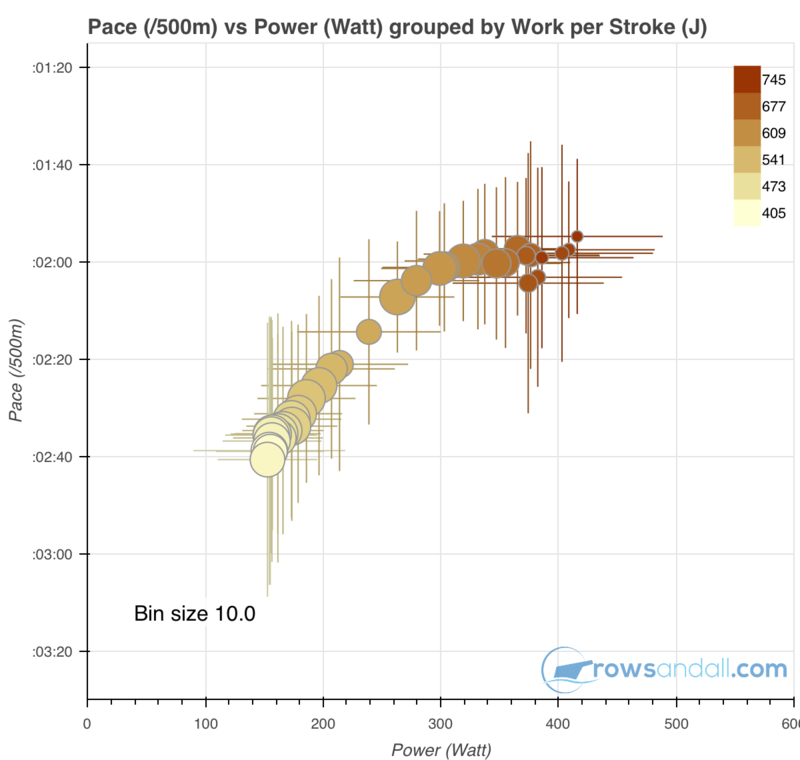 However, it is not given that the Empower Oarlock power values correspond exactly to the erg power. Anyway, it doesn’t matter. If I go out too fast, I will finish slow. 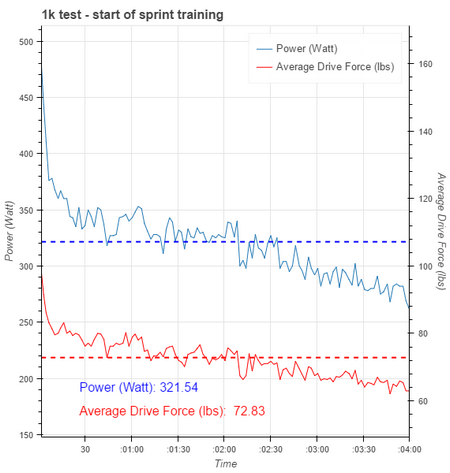 If I go out too slow, I should sprint to the line to get the power average as high as possible. 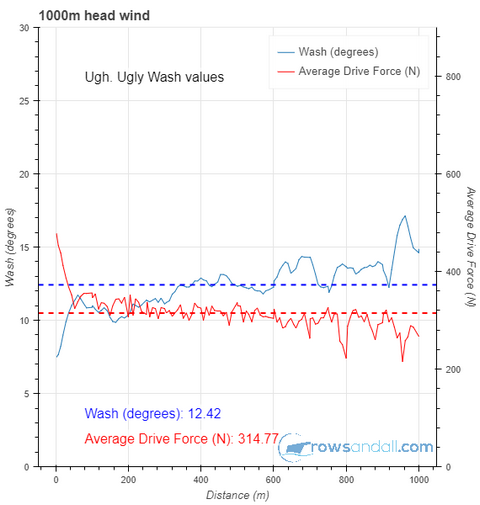 Make use of all of rowsandall.com’s data analysis power to find out as much as possible about how I did that initial 1k. 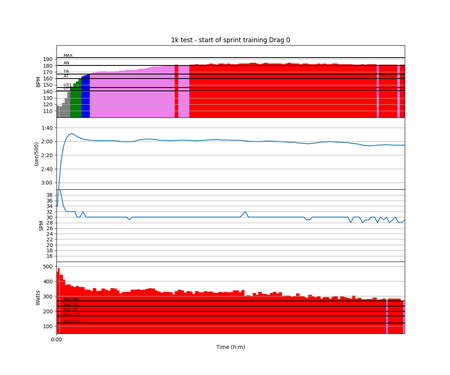 Next time, row at the average power I achieved and use the lessons obtained in 3 (hopefully). I made use of a gap in my schedule, after lunch and before the evening conference calls. It was a warm afternoon, a slight drizzle, 15 degrees, and flat water. Only a light wind, which turned out to be a headwind for my 1k. At that point I was in the buoyed 2km track, about 800m from the finish line. 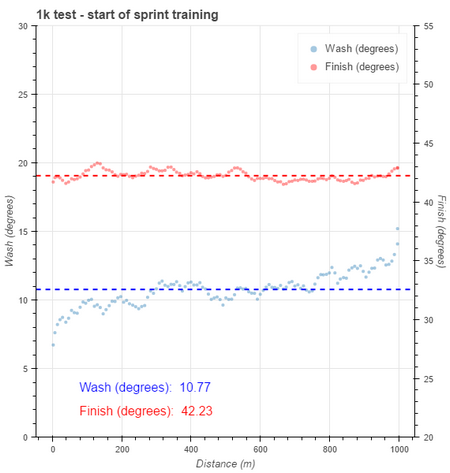 I mentally prepared myself for “a lot of red” (referring to the power and heart rate plots), dialed up a 1k on the SpeedCoach and got into starting position. So yes, I went out too fast. 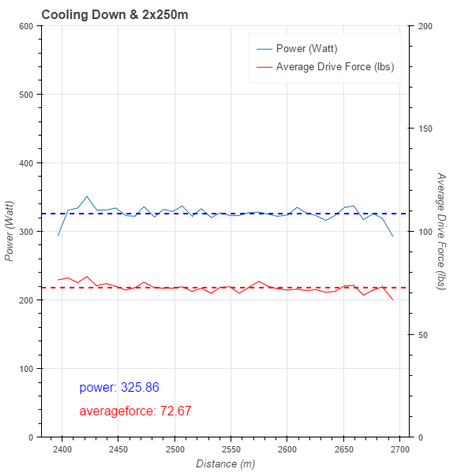 But I did obtain an average power value, and it’s 320W. As usual in a 1k row, around the 500m mark things started to fall apart. I really had trouble keeping the stroke rate at least above 30spm (where I should be at 32spm in a couple of weeks), and in the slight headwind everything just became very sluggish. I was happy though that the total time was not too far from 4 minutes. Usually, in April, my 1k OTW time is around this, and today it was into a headwind. Below, I will add some detailed discussion of the various other metrics. I paddled the 350m to the finish line of the 2k course, turned the boat, and continued in a light “steady state” row. 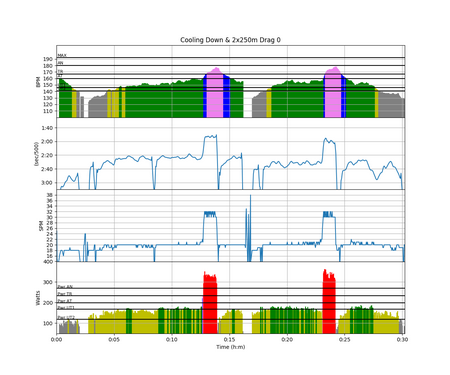 During that steady state row, I did two 250m pieces, just for the fun of it, to test how 320W of power would feel at 32spm. I did one piece in tailwind where I saw 1:55-1:56 pace, and one in headwind where the pace was around 2:00. Yep, it became a sad story after 700m. 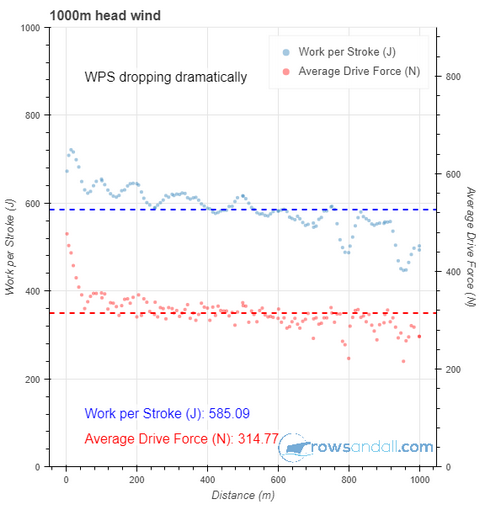 Work per stroke varied quite a lot during the row. 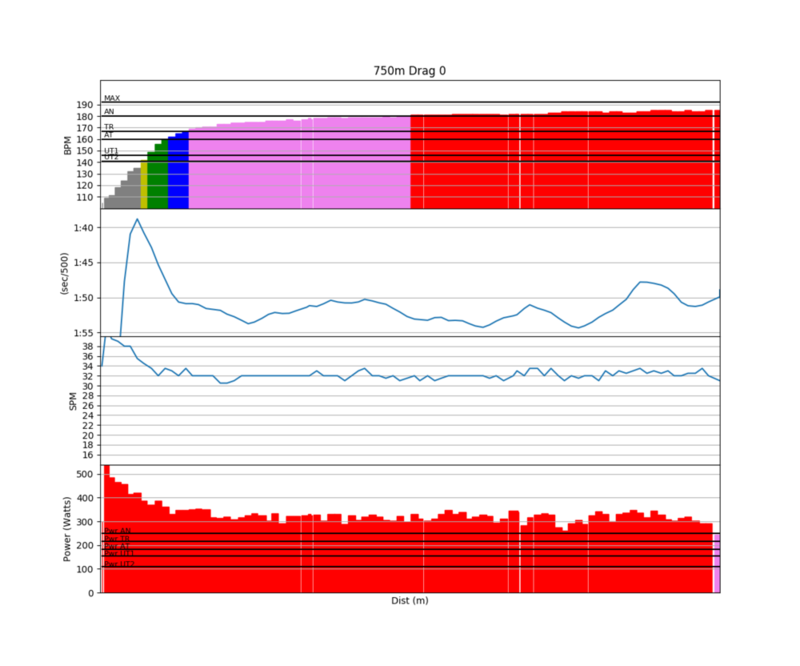 The mean value was 648J (which is high), while the 25% and 75% boundary was at 593J and 678J respectively. 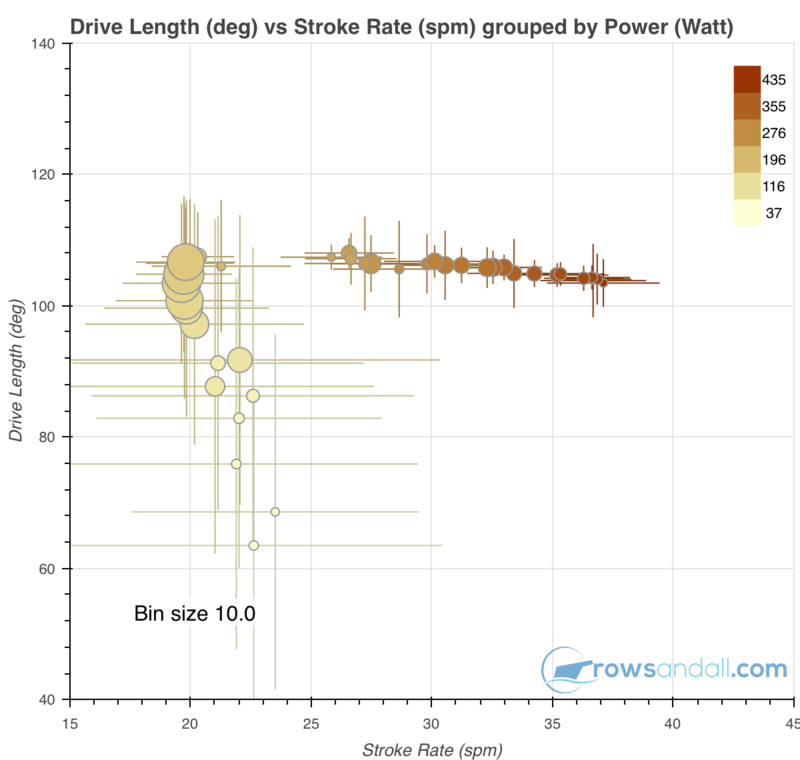 So that means that more than 25% of the strokes (about 30 strokes) were at more than 678J, and about 25% of the strokes were below 593J. 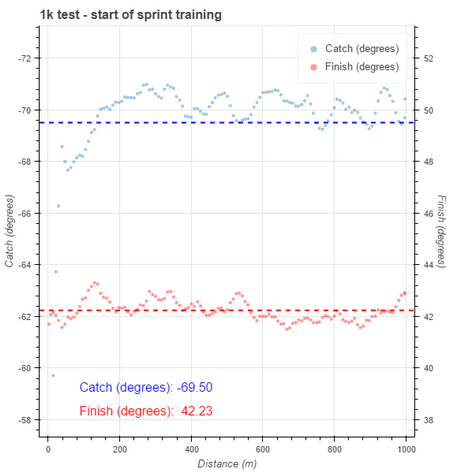 For head racing, I wanted to be around 550W, and I think that is even a good value for sprint racing. At least, that’s my hypothesis, still to be confirmed. For now, I note that I should rate up and lighten up. Oh well, I also dropped the rate in the final 200m. Booh, Sander! Here are the two “250m” pieces that I did afterwards. Of course these were shorter pieces, but they did feel better. I think I have a plan for my upcoming 1k race. Also, I am still impressed by how incredibly useful these metrics are in analysing what happened, and how, if you put in a little thinking, they guide you to what is hopefully a better plan to attack the next 1k piece. A classic Masters Worlds. Thousands of competitors. A race every three minutes. A very friendly atmosphere. Overall very good rowing. “Oldies disco” at the Masters Party. Lots of merchandise. Nerves. Lots of very enthusiastic volunteers (thanks guys!). 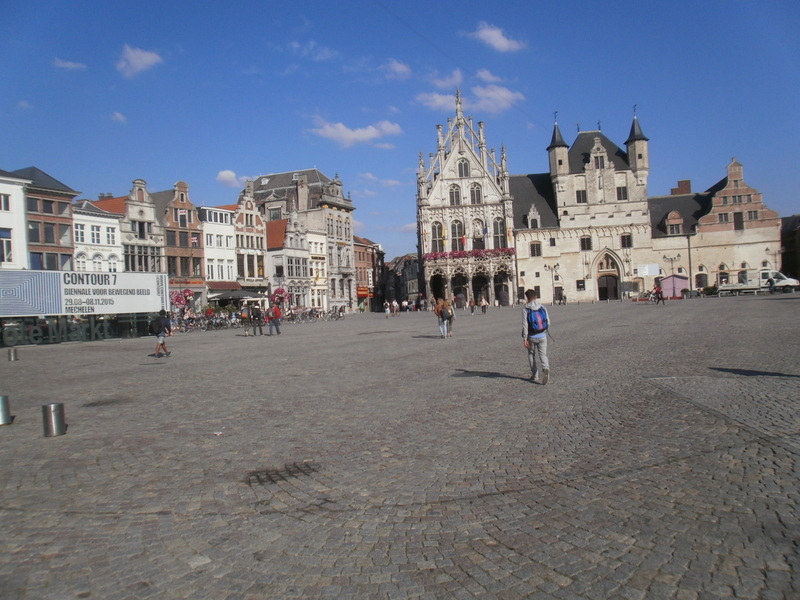 The weather (it remains Belgium after all). Food stalls accepting tokens purchased at a central place, thus almost no queues. Our accommodation’s very central location directly next to the finish tower. The food in the cafeteria (we had half board). The relaxed attitude of the organizers: you could come somewhat early for your bow number. Trailers could be left were you wanted as long as they didn’t block access to anything. 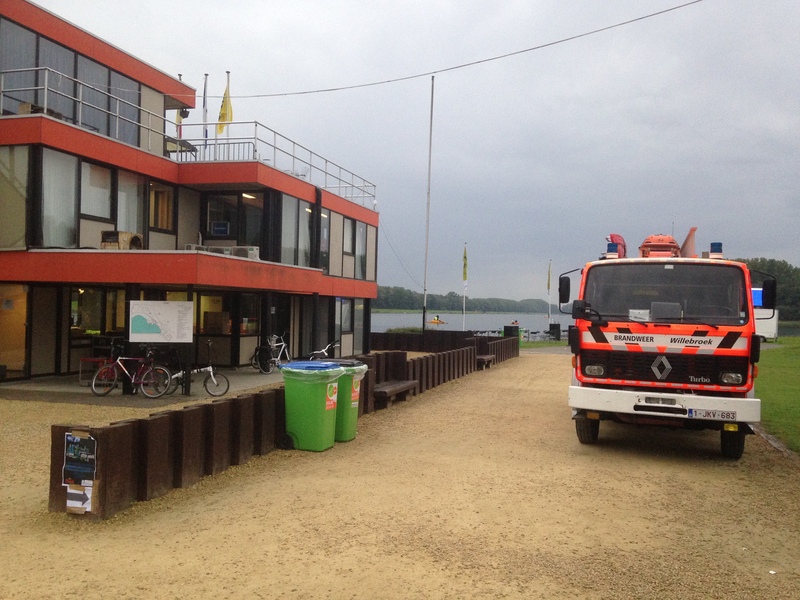 The organizer’s responsiveness to complaints: After day 1 they regularly cleaned the duck poo from the docks. Duck poo on the docks on day 1. Overweight children on the starting pontoon causing damage to boats. The commentary was absent or uninspired. The top level of the boat racks was too high to reach for ordinary humans. Next time I will refuse to tow an unknown trailer. We wanted to take my own trailer, but one of our teams made a last moment decision to take a four and use a bigger trailer. They convinced me that it would be inefficient to tow two trailers. I agreed, when it was time for my part of the towing (the Hazewinkel-Brno leg) I found out that this trailer is a bit too long and unstable for my car (even though it is supposed to be OK on paper). I ended up having to drive 80 km/h to avoid snaking, so the drive home took 14 hours. As an experiment, I am going to tell the story by boat type, not chronologically. I think it is interesting to have the “similar” races close together. So here we go. 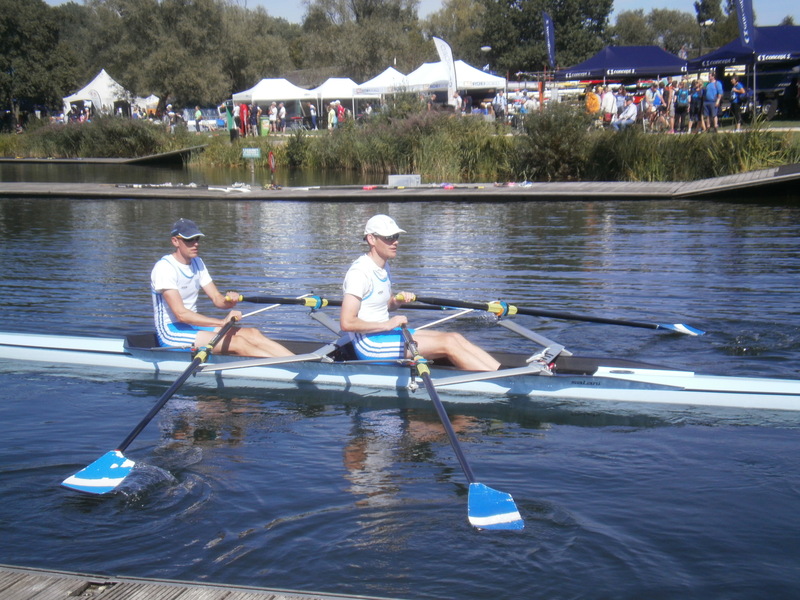 On Thursday afternoon we had our first race of the championship, the Masters B 2x, which I rowed with Radek, my regular double training partner. We have won easily in Hodonin and at the Masters Nationals, but I did not consider ourselves as victory candidates. Expectations for the race were to execute the race plan well, fight for a good place, and row a faster time than 3:35. This last requirement was a bit arbitrary, as I had no idea how the headwind would affect our pace. 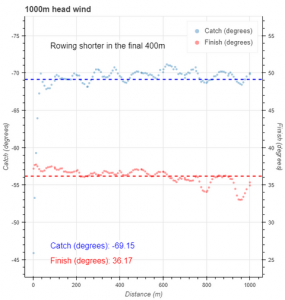 The race plan was to row “at 90%” the first 500m, then do a 15 stroke push. The “at 90%” is not real, but I found out that Radek has a tendency to fly and die. 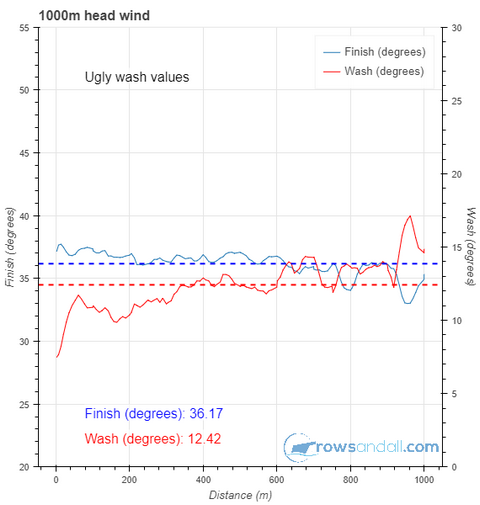 What felt like a mild headwind at the finish turned out to be a quite strong head/crosswind in the starting blocks. Radek was constantly paddling to keep the boat pointing slightly into the headwind. 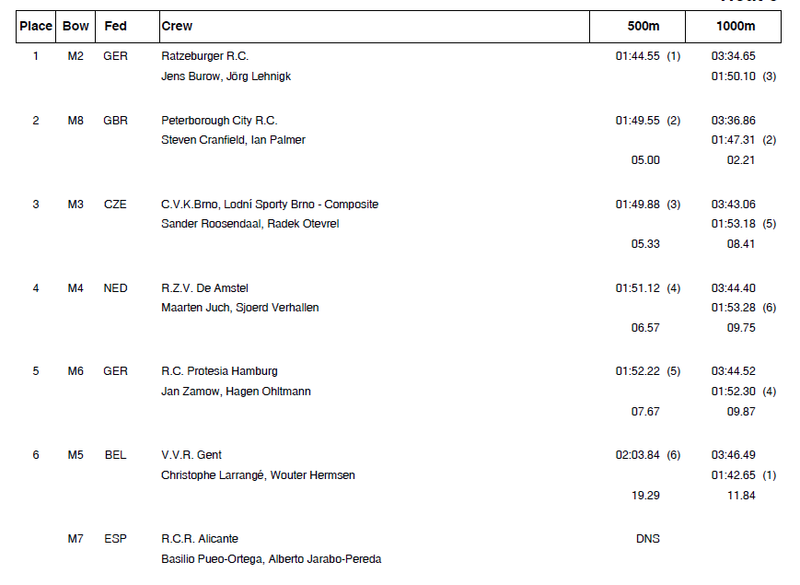 I think we rowed this race quite well and I am happy with the end result, even though it is not below 3:35. 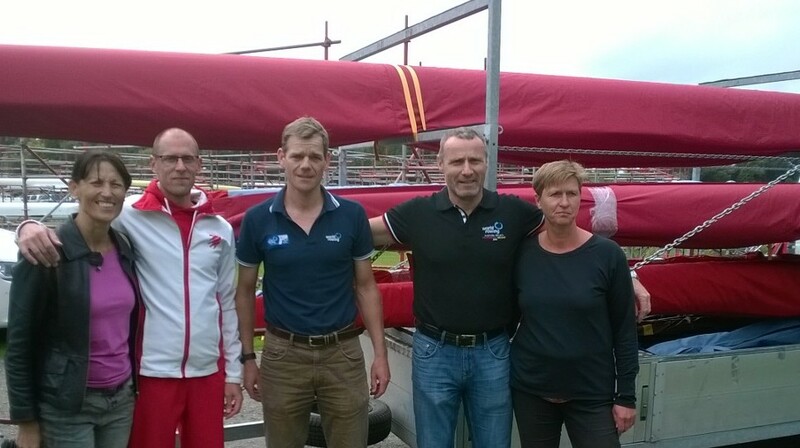 We did a good start, settled for race pace, and crossed the 500m in third position. In my memory, the Germans next to us disappeared into a strong lead immediately. We were rowing quite well in the pack. Our push worked, in the sense that it kept us in third place at a point where the British started to row away from us but the guys behind were trying to catch up with us. Our race was really about protecting our third place against the three boats behind us. In terms of virtual medals, with our time of 3:43 there were 5 heats (out of 13) that were slower and we would have won, a few heats where we would be very close to the winner (and leading at 500m), and 2 heats where the finish time measuring system failed, but looking at the 500m times we would have been close. 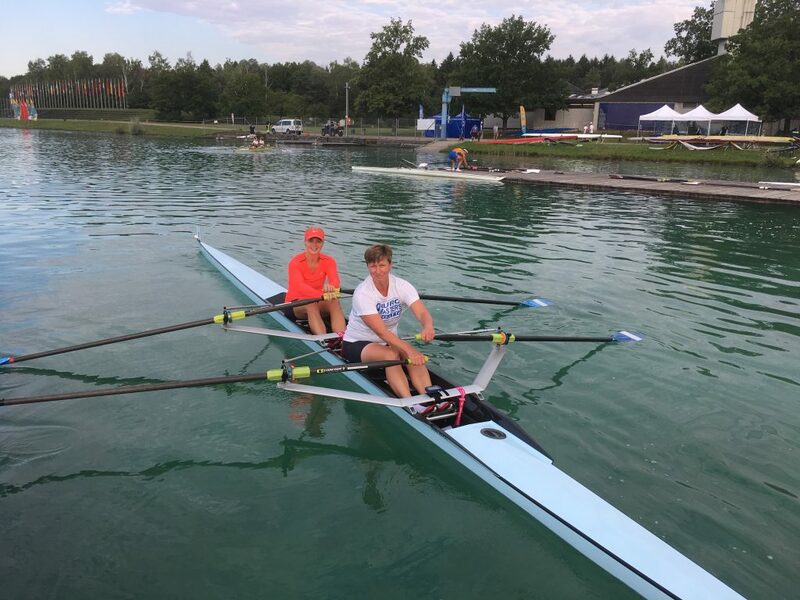 The very first heat of Masters Men B 2x actually rowed into the preceding heat of Women’s D 4+, resulting in an unmeasured time. Radek’s parents have filmed our race, but it will take some time to get the files from the tape. 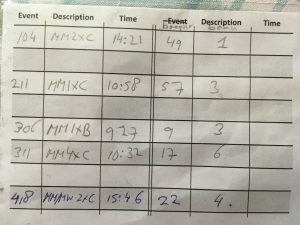 My second doubles race was on Friday afternoon, after the first quads race. This one with my old rowing buddy Arjan, with whom I have trained less than 20km together, 13km in one session earlier this year, and 4km on Thursday morning. Again a head/crosswind. Perhaps slightly weaker than on Thursday. I wonder if there is an easy way to find old weather reports so I can check. Anyway, rowing on lane 6 which was less protected than the lower bow numbers. Again, I knew we couldn’t win this. We were up against Dynamo Moscow with Ovechko and Yurchenko. Ovechko is really fast and they won their race on Thursday (in an unmeasured finish time but giving us 10 seconds at the 500m mark). These Dynamo guys train like they participate in the Olympics, and actually many of them are former Olympians. 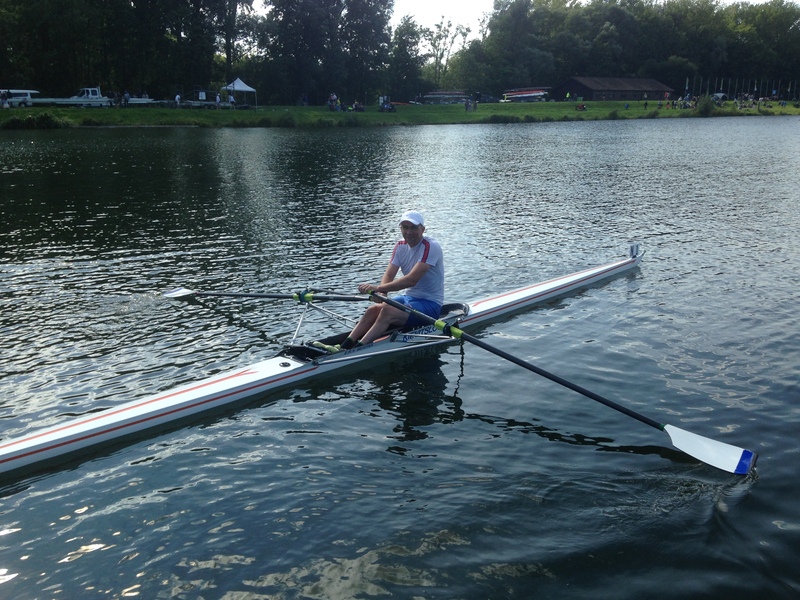 Ovechko himself rowed the Lightweight 2x in Athens. We had a very good start, especially given that we had practiced three starts in total. The Russians disappeared quickly but we were rowing in the pack. It seems that most teams did a push with about 600m to go, because that’s where I noticed that we were losing ground. 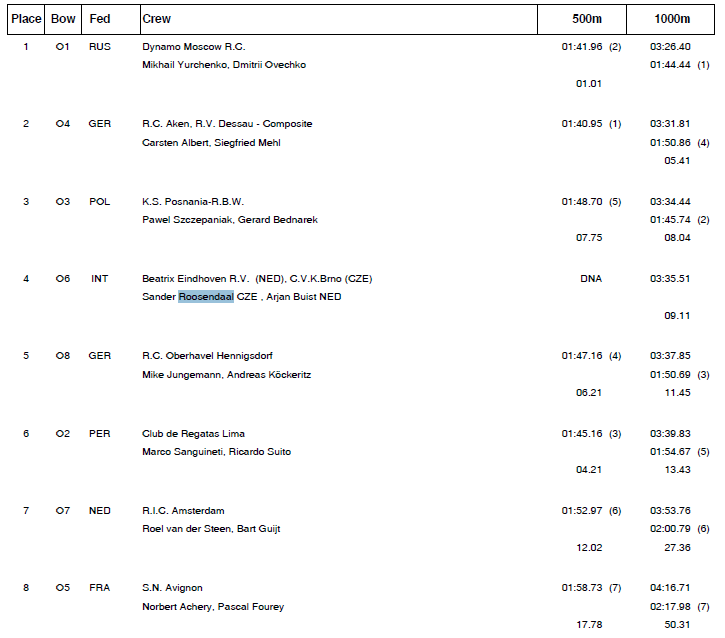 Unfortunately our 500m time is not recorded, but I think we passed with only 2 boats behind us, in 6th position. At the 500m mark I called for a push, and that brought us back in the field. I didn’t actually end the push, but kept on rowing at the higher rate. Before the race I was afraid that my legs would be tired after the quads race, but all felt good. I have the CrewNerd data somewhere but didn’t look at them yet. I didn’t look at CrewNerd during the race but feeling wise I was doing 33-34 spm. In the second half of the race we managed to push away from the Germans and Peru behind us but we didn’t catch up with the Polish. Fourth place, right in the middle. The Russians won easily. Compared to the other heats, our 3:35 time was not bad. There were four other heats where we would have won and 2 where would have been within a second. It’s a pity that the draw put us against those pesky Russians. Pictures were taken by Arjan’s wife, but I haven’t received them yet. 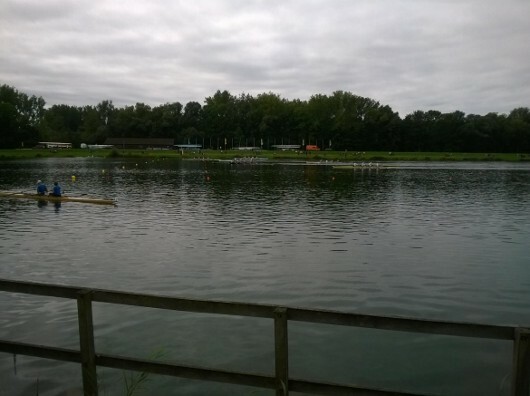 Two quad races, the Men Masters A 4x (Saturday) and the Men Masters B 4x (Friday morning). 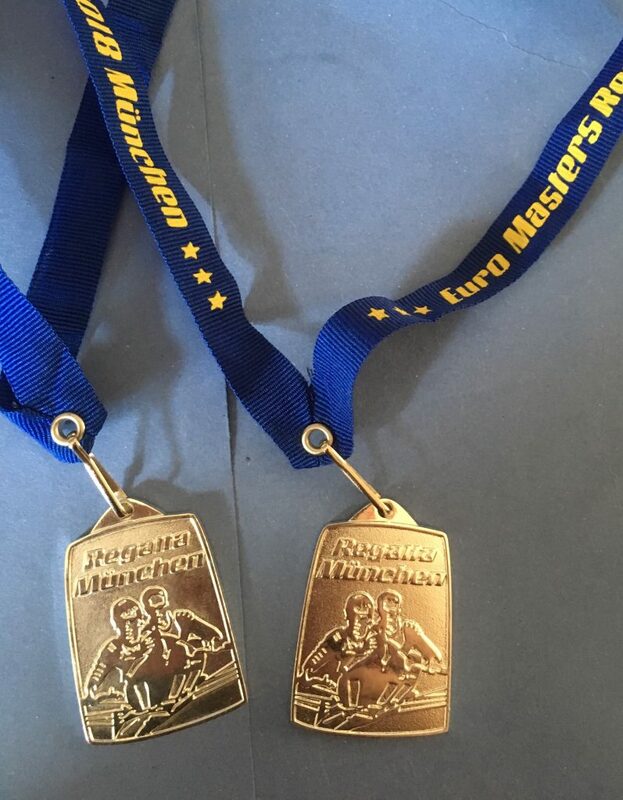 We have raced one race together, the Masters Nationals, where we took the silver medal. 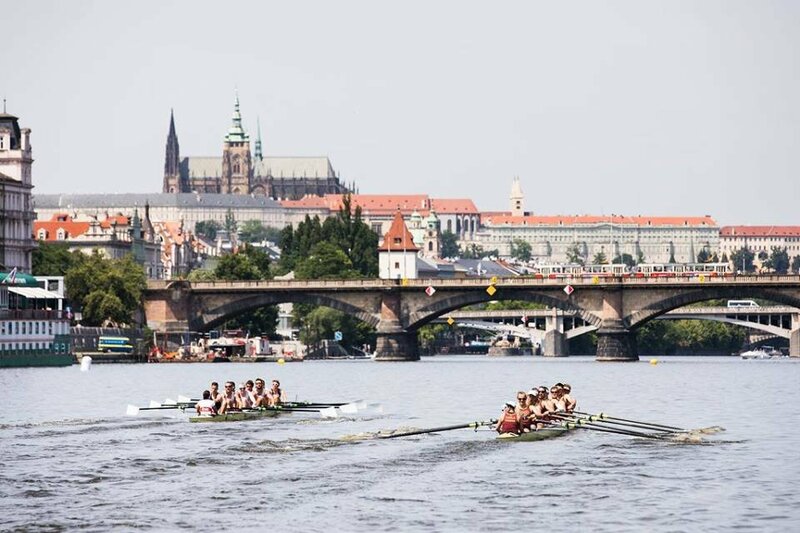 We have trained on our club boat, but decided not to take it to Belgium and borrow a boat from the Prague based club Slavia instead. 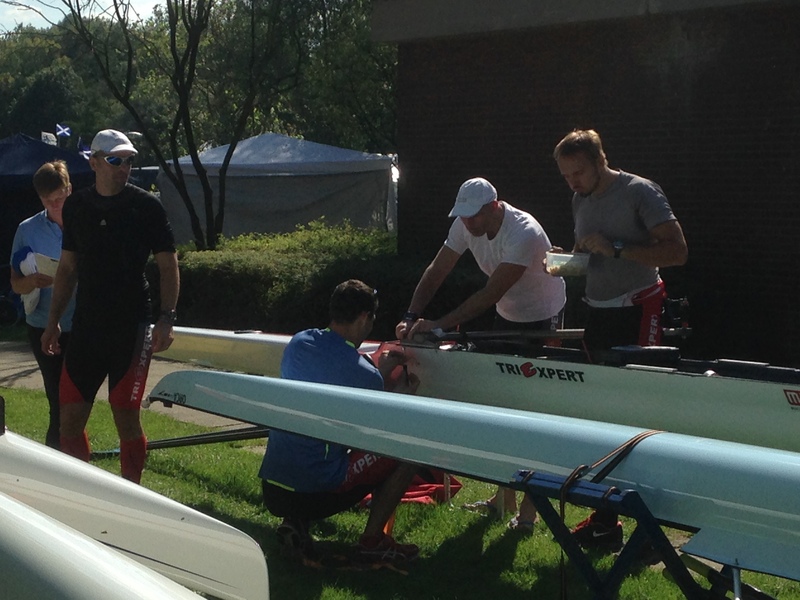 I have rowed on this boat, the Sergej, in Varese, and it was good. Unfortunately, when we took it for a short row on Thursday evening, we discovered that it is rigged too low (even at the highest setting) and I also suspect the height difference between the left and right oarlocks was not good. Having rowed Varese in bow, but now stroking the quad, I also found out that this boat has quite a big rudder, so in the practice I ended up bouncing from buoys to buoys instead of taking a nice center course down our lane. So the Friday race was a painful event. We started off badly, rowed at the back of the field. The Italians took the lead, but as I had predicted they started to fall back already before half way. 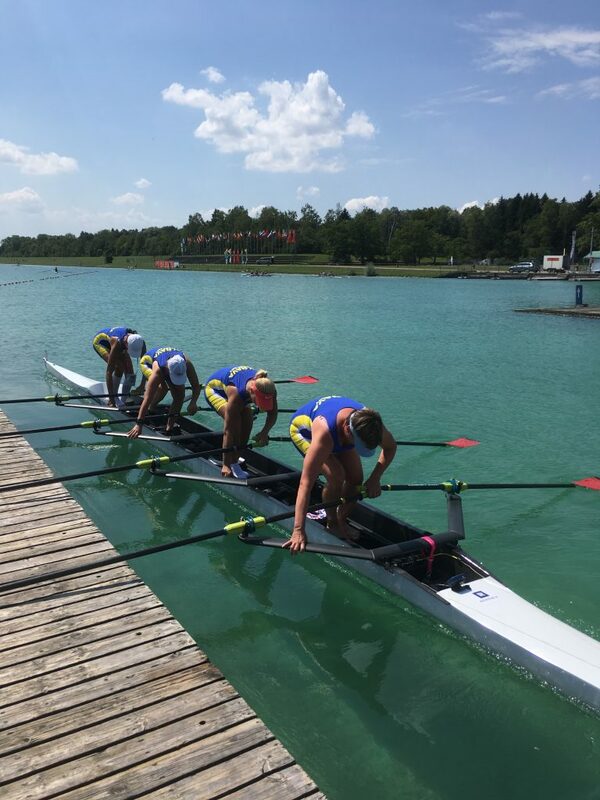 We struggled our way back into the field and passed the 500m mark in fourth place just before the Austrian Masters Nationals champions (rowing with one Canadian sub). Rowing at the high stroke rate usual in the quad and with the bad rigging, I really started to feel my legs giving up with about 400m to go. Last 250m was just pain. We finished fourth. All other heats were faster than us. Our Saturday race was only 2 hours after my race in the single. So I sent the guys for a warming up run but decided to not join them, picking up the bow number instead. When I arrived at our borrowed boat, I was approached by Slavia guy who told me that the rudder was broken. The boat is an older Vespoli and they have the rudder cables above the stern deck. Apparently, the rudder construction had hooked under the starting pontoon, and when it got lose, the entire rudder axis was at a backward angle of 10 degrees, leaving the stroke unable to move the rudder. So there I was, alone, with my crew gone, and a broken boat. I chartered some people to help me put it in slings and contemplated how to quickly repair this. It seemed the only way was to take a pipe and to force pull the axis back in position, at the risk of breaking the little aluminium rod, which would leave us entirely without rudder. In the end we did just that and managed to get it back somehow. I tried to steer with the foot and I was able to get some response. Rowing towards the start, I had some time to try out the “repaired” rudder. I had to use a lot of force to turn it and it had basically three positions: Ten degrees to the left, 30 degrees to the left, and 20 degrees to the right. I spent the time waiting at the start explaining to the starting pontoon kid that I forbid him to pull the stern under the pontoon. In the end he had instructions to do it anyway but he promised to push the stern into the water at the starting signal. Also, he was a small, lightweight kid, so there was about 1 cm of space between the top of the rudder and the lowest point of the starting pontoon. Bouncing from one side of the lane to the other we made our way to the finish. 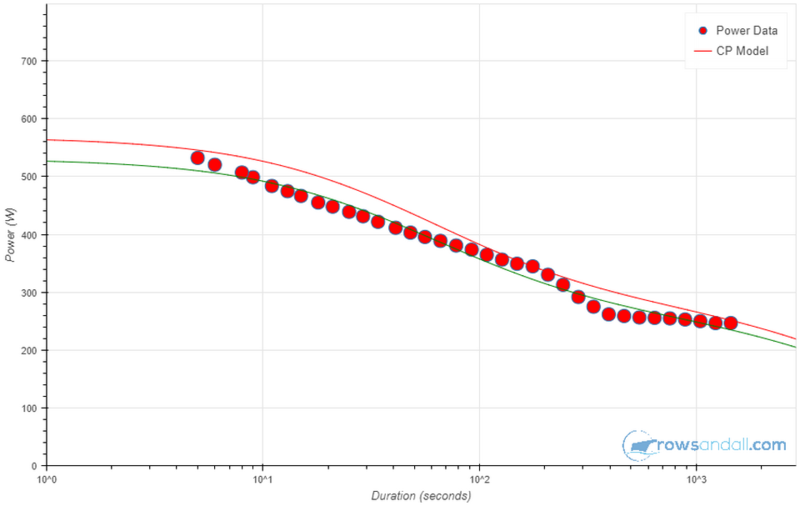 We rowed a slightly faster time than on Friday, with a slightly slower start. Still, 3:20 is slow for a quad. My legs were trash during the entire race. Probably tiredness from the singles race and the two preceding days. This time the Austrians beat us on the finish line. 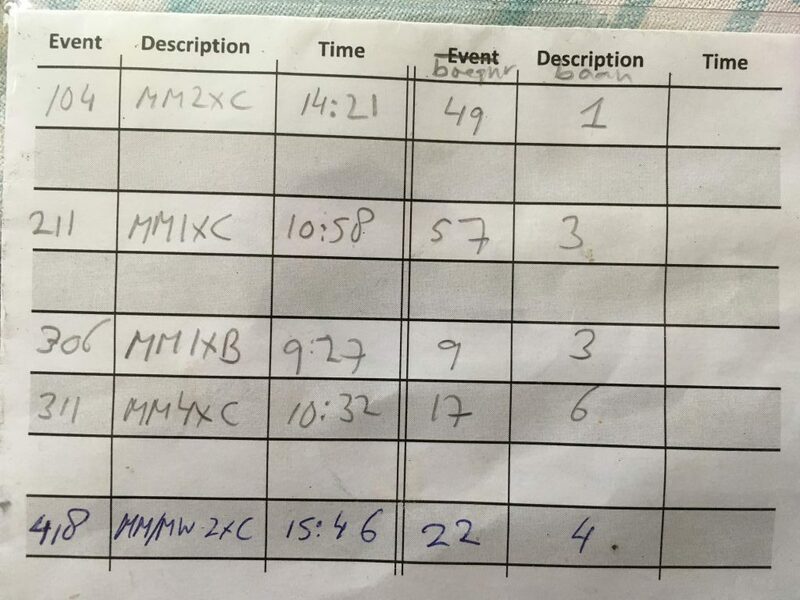 This race was on Saturday morning, at 9:34. My only singles race. I didn’t know what to expect, not knowing any of the other competitors. I was super nervous. Met Ben Redman when I picked up the bow number and we chatted a bit. He looked nervous as well. He rowed the race before me. I saw him doing his start and first 10 strokes, which looked mighty agressive. I was too far away to get wet, but it was quite splashy. Fast out of the start. My plan was to do a push with 600m to go, as was the fashion on these championships. The expectation was that depending on the strength of the other guys, I would be either somewhere in the front or somewhere at the back. First 400m of the race all boats were rowing on one line, but when I actually started my push, I was starting to fall behind with a few others. The result of the push was that I stayed “somewhere in the middle”. In the second half of the race two boats started to fall behind by a lot, two boats passed me and I ended up dangling at the end of the pack. I decided to not save anything for the quad (knowing that was a badly rigged boat) and kept pushing to at least row a reasonably good time. Comparing with the other heats, I would have ended up 5-10 seconds by the winner in most cases. One heat was slower than my time. Sunday was mixed races day. 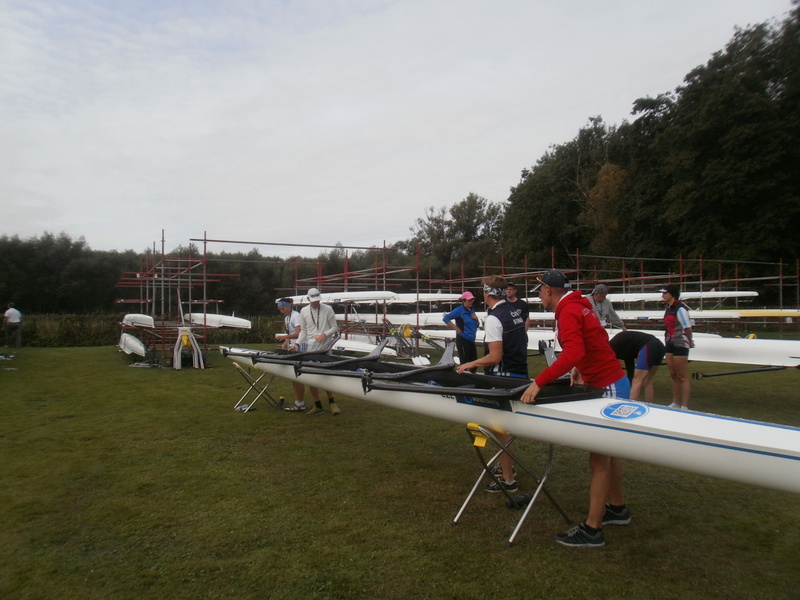 At 11:30, we would start in the mixed quad in a rented boat from Filippi. In the end I was glad that Slavia wanted to return home on Saturday and couldn’t borrow us their boat, and I was looking forward to a nice Filippi. We arrived at the rental location early. Officially they don’t give you the boat until 30 minutes before the start, but as I know the German representative of Filippi, we got a VIP treatment and were told to chose any boat of our liking. In the pictures above we are looking for a good boat in our weight category. In the end we chose a quad with carbon front wing riggers, with CZE printed on the side. Apparently it has been used by a Czech team in the past. Unfortunately, we discovered that the bow ball was missing. As told above, I had friendly access to the highest boss of the boat renting business, who immediately sent an Italian guy to bring me a bow ball. In the past, Filippi didn’t allow any rerigging of their rental boats. They were all rigged to the same rigging numbers, and the only thing you were allowed to move was the foot stretcher. This time they allowed to move sculls as well. So it was a nightmare to find four sets of sculls of approximately the same length. We ended up changing a few, but due to lack of time we couldn’t do more than set all scull lengths to 287 and inboard to 88.5. After all that stress we launched the boat. We arrived at the 2km point with 15 minutes to go before our official start, but somehow the referees kept urging us to go to the start immediately. It turns out they were trying to start the races ahead of the official schedule. I don’t know why, but I suspect some bad weather was approaching. It didn’t work out anyway because the Japanese team in the doubles race before us had a broken boat and were allowed 10 minutes to repair. Light headwind at the start, but less windy than in the previous days. Both the Polish to our left and the British to our right looked very impressive. Compared to Radek’s 65kg and my 73kg their guys were definitely giants, and also their girls looked very athletic. I am afraid we looked underwhelming. 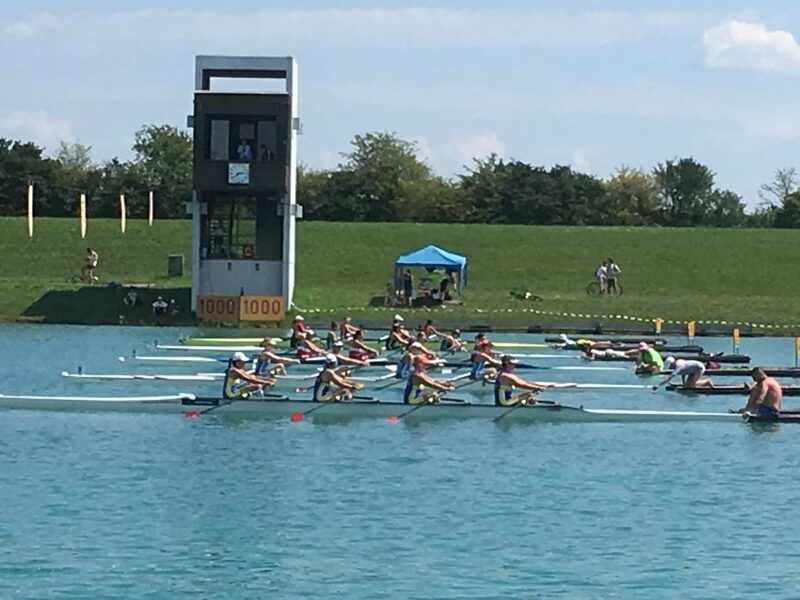 It was Lubica’s first international race since the W4x final at the Barcelona Olympics, and she was thoroughly enjoying it (and also admiring the strong guys in the other boats). The officials did a fast start “because of the weather” so it was Attention – honk and off we were. We had a fantastic start and were rowing right in front with the Polish and the British, and the Austro-Hungarian boat. One German boat was right behind us, followed closely by Chile. The second German boat closed the field. 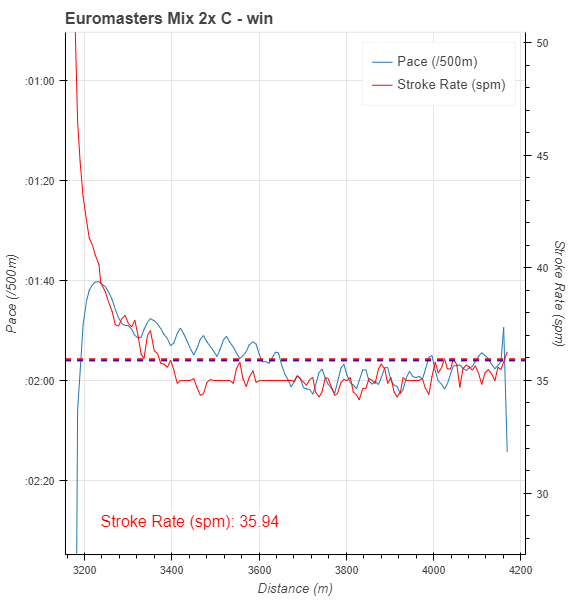 With 600m to go we were starting to lose, so I called for a 15 stroke push. Lubice on 3 supported me by emphasizing a fast hands away and our stroke rate shot up to 36. In 15 strokes we were back in front. I focused on the steering and didn’t dare to look next to me too much, but I saw the sterns of the Polish and British in my peripheral vision. With 400m to go I called for another push and I think we were briefly in the lead. The Polish started to push away and Romana, feeling a possible victory, called for a final sprint. 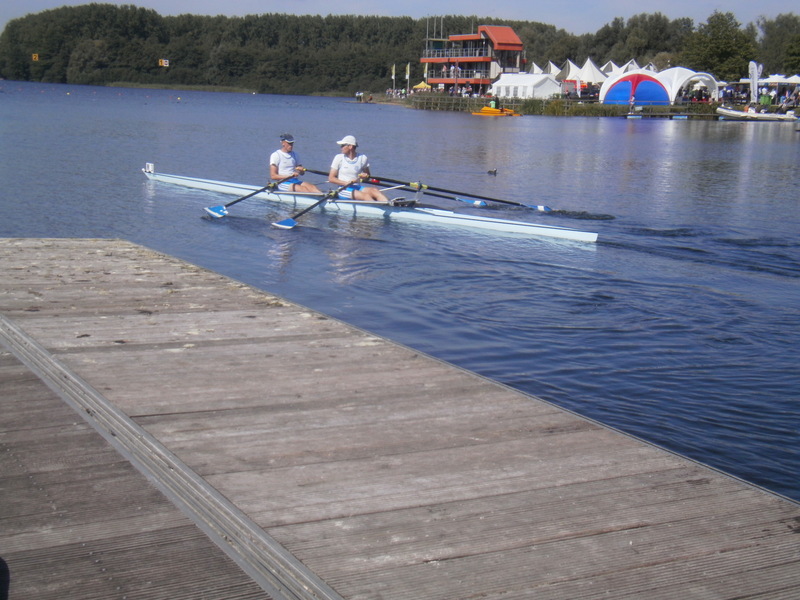 In the final 250m I believe we rowed half a length behind the Polish and one or two meters in front of the British. Honk Honk – The British and us. I immediately knew they were a fraction in front of us. Must have passed us in the final three strokes. 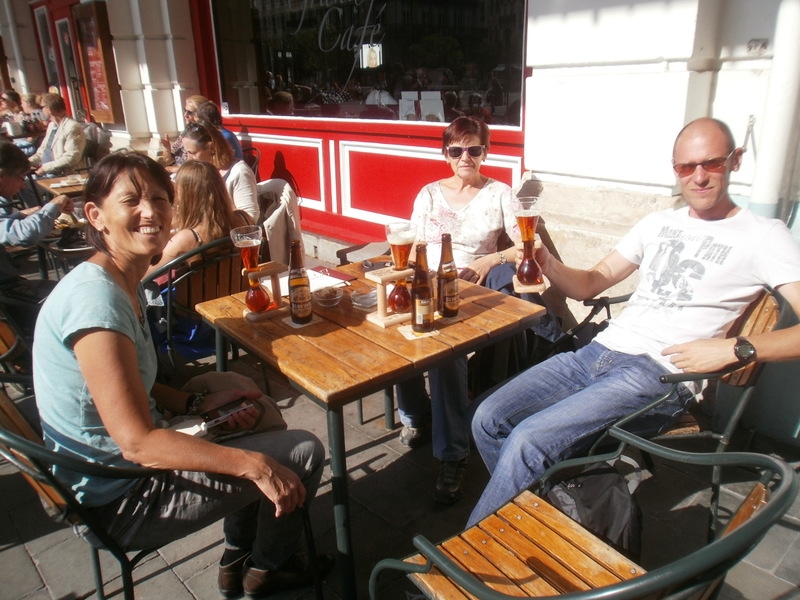 We cheered three Hurrays for the winners (a Czech tradition) and congratulated ourselves on a fantastic effort. Really a brilliant race. We were much better than we had imagined. We didn’t have much time to recover. The quads race was at 11:30 and it was delayed by 10 minutes. We had to row back to the 1000m to leave the boat at the Filippi boat rental. We walked/hiked the 1000m back to the finish, just to flush the lactate a bit. 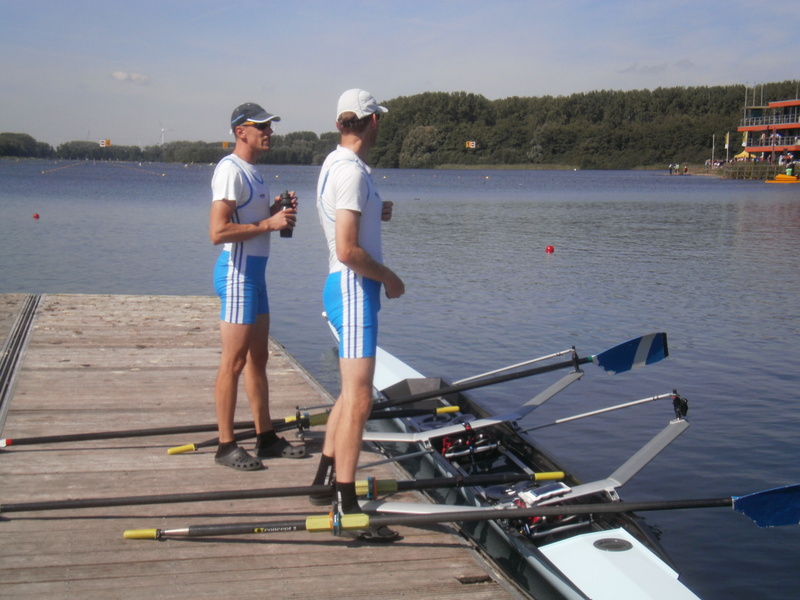 Then we had to immediately launch for our doubles race at 13:00. Arriving at the start after such a thriller of a quads race, we didn’t expect to win. I told Romana we would race the boat that would end up next to us, just to enjoy a good fight. 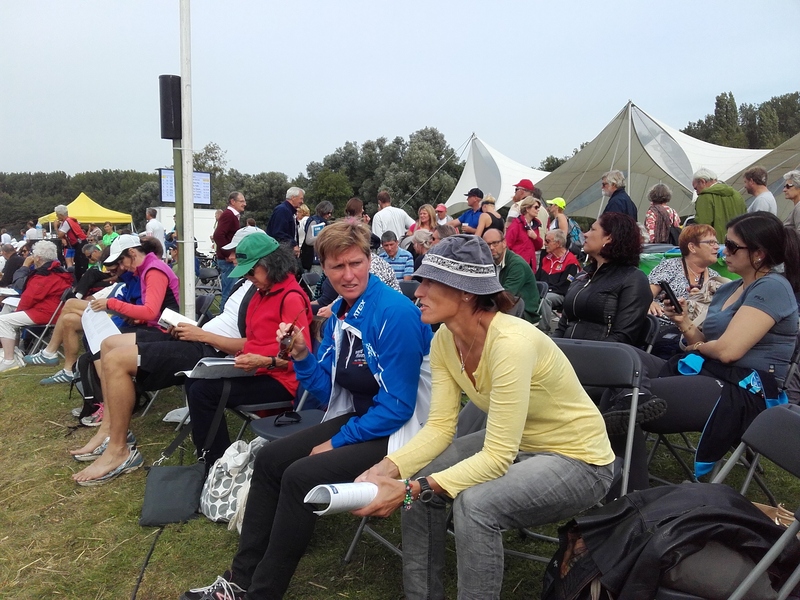 Next in the starting block was an Austrian mixed couple from Vienna who we know, so we wished them good luck and then concentrated on our race. Again we had a brilliant start and to my surprise the first 500m was quite comfortable. The Austrians took the lead. The French and the Germans started to lose immediately. The rest was rowing in the pack. To our left was a Dutch club with a lady who had already won 4 or 5 events in the past few days. I tried the 15 stroke push but that proved a bit too much for our legs. The Portuguese had a better push and passed us. 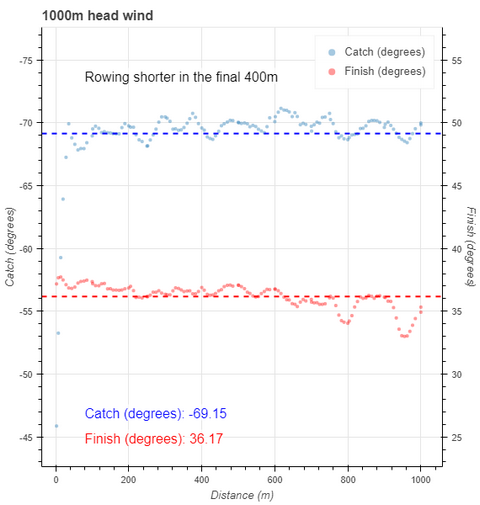 We ended up rowing just behind the Dutch (who I had expected to be more in front) and that inspired me to call a final sprint and increase the stroke rate with 250m to go. Romana made some desperate sounding noises on the bow position. She was starting to fall apart. So was I but with the last of our energy we managed to pass the Dutch and keep our bow ball in front of theirs. Hurray, we had beaten them! 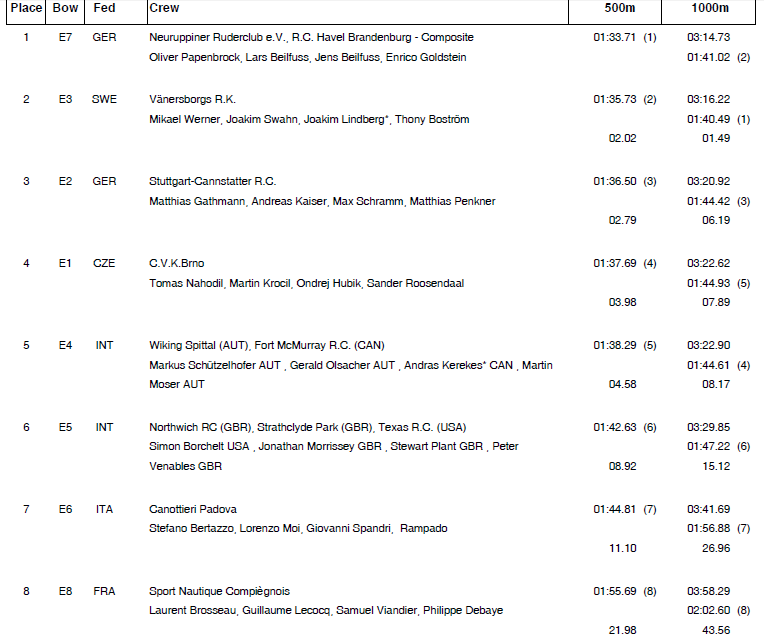 I am happy with our time of 3:57 considering that we were very tired after four days of racing, the great mixed quad race just before this one, and the fact that the headwind was stronger again. 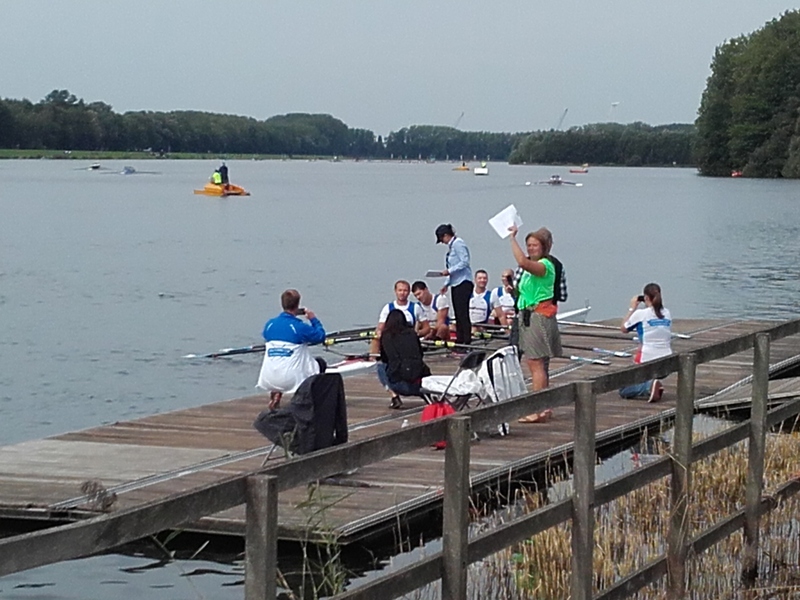 After the mixed doubles we had a cooling down consisting of the four strokes between the finish line and the dock. 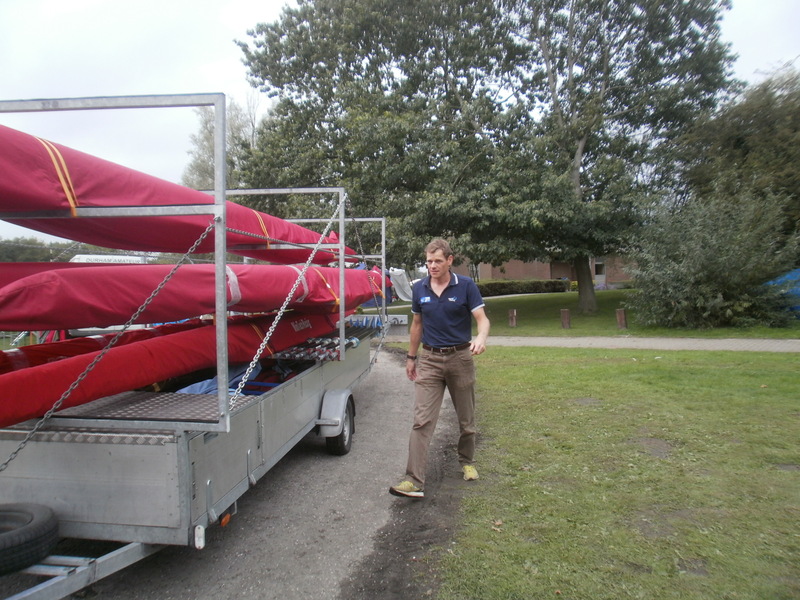 Then we prepared the double for transport, put it on the trailer, and went to get the car. I changed to normal clothes on the parking lot, without showering, got the car in front of the trailer and off we drove. 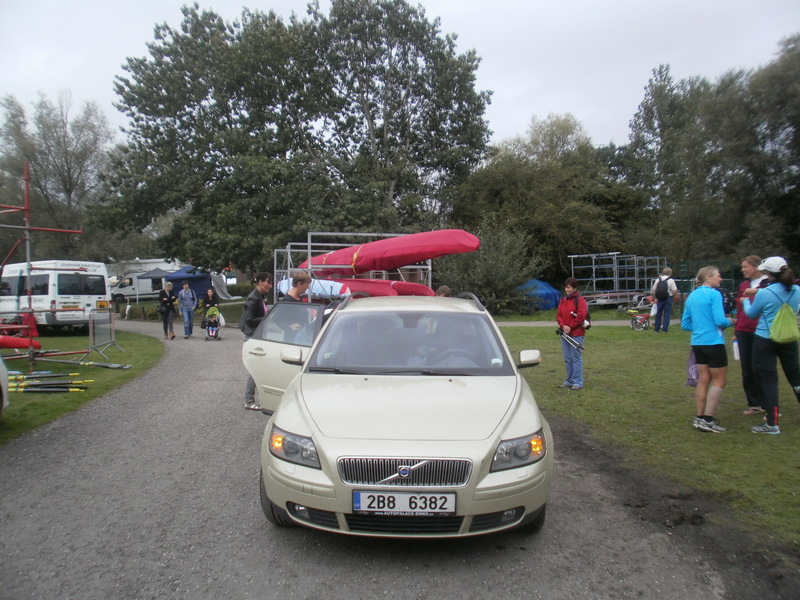 Driving on the regatta venue was quite challenging with 10 trailers trying to enter it, and 5 others trying to leave it at the same time. By driving slowly and having friends walking at each end of the trailer, I luckily managed without any damages. We left at 2pm, one hour after our start on the mixed double. The first surprise was on the highway towards Antwerpen. I decided to take over a slow car (it was doing slower than 70 km/h) and driving at around 100 km/h I noticed that the trailer started to snake. I reduced speed and at the first gas station we tried to improve the driveability by moving some weight to the front of the trailer. It didn’t really help. In the end we had to drive around 90 km/h on good roads and around 80 km/h where the highway had ruts. The whole trip took us 15 hours. 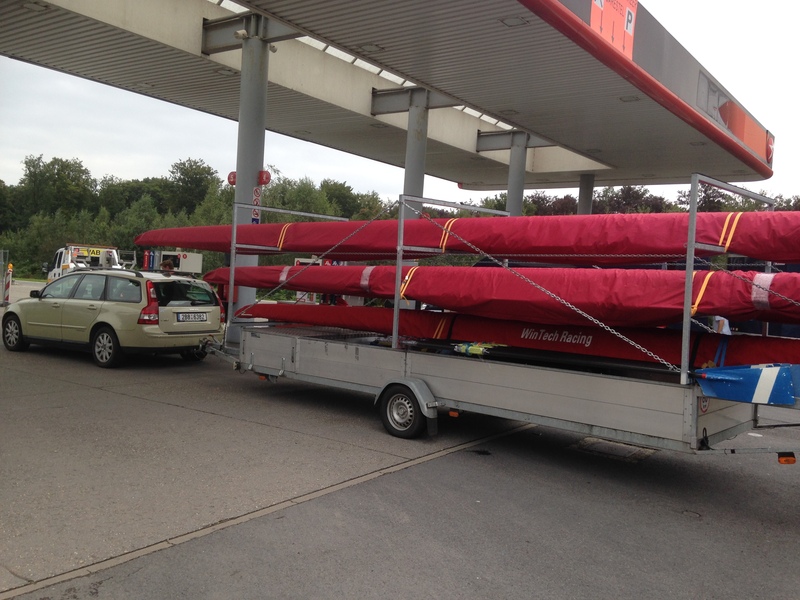 We arrived at the Brno rowing club by five in the morning. In bed at 5:30 for four hours of sleep before I went to the office. On Tuesday morning, I really hated having to sit in the car again to drive to meetings in Prague on Tuesday afternoon and Wednesday morning. A good regatta. A few very nice races and good times, but unfortunately no win. I am starting to think that the regatta date early September is not ideal for us with school-going children. It’s the second week of the new school year, but more importantly, this regatta is inevitably immediately after the summer vacation. I believe I had better form in July. This is also the reason why I will probably not go to Copenhagen in 2016, but compete at Euromasters in Munich in July. And I will never again tow an old, unknown trailer. Strictly my own which was designed and made by a certified trailer builder with safety and driveability in mind.